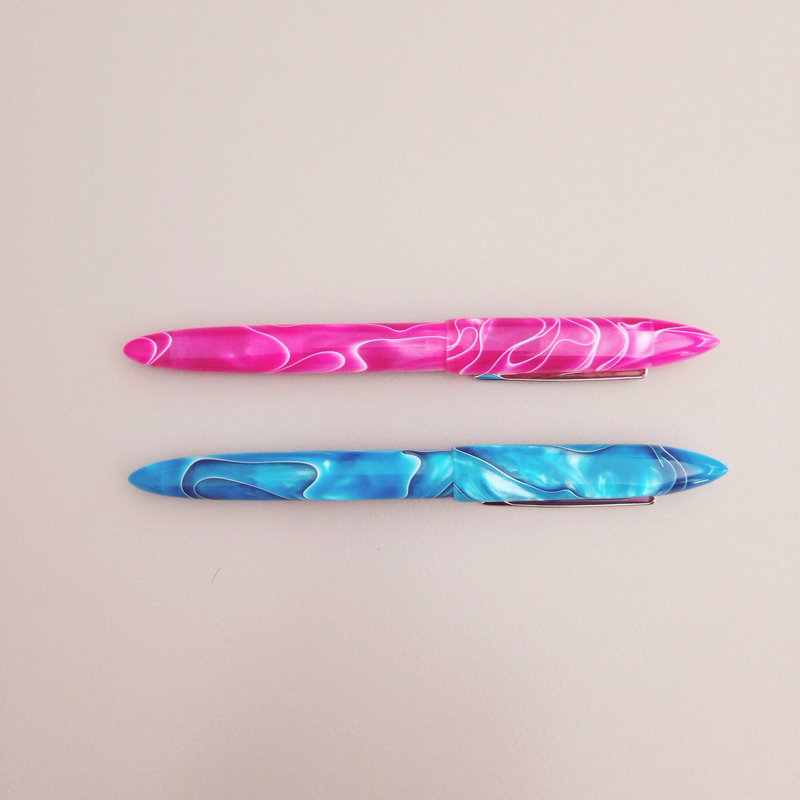 The above photo started a discussion about flex pens and that started a discussion about Noodler’s fountain pens and how I don’t have a single Noodler’s fountain pen that works like I’d hoped. 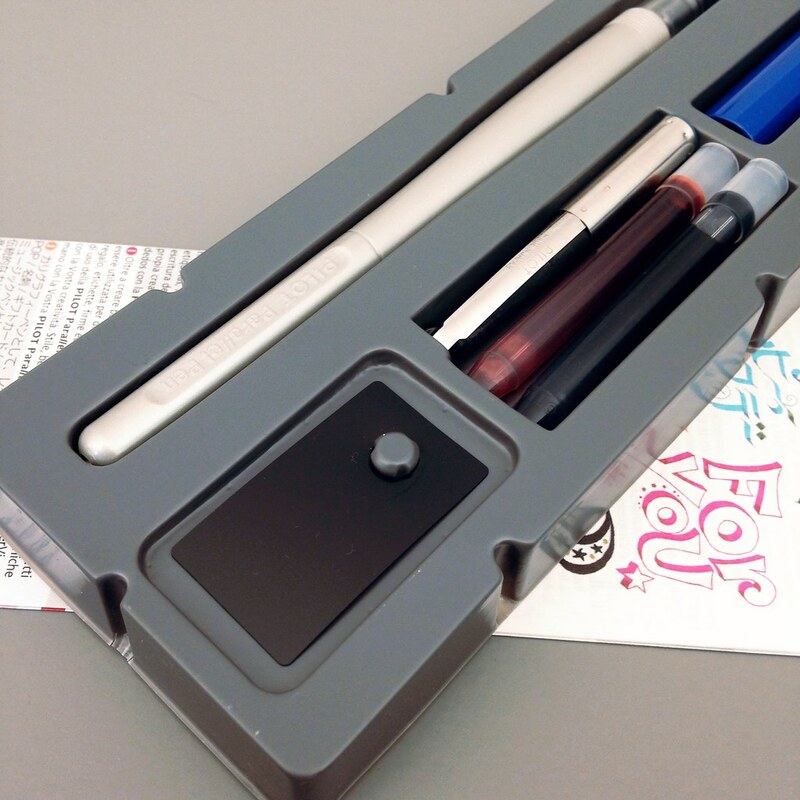 Feeling inspired, I found all of my Noodler’s fountain pens and a container of one of my most reliable inks – Pilot Iroshizuku’s Fuyu-syogun. This one accepted the ink easily. I love the blind cap covering the twisty thing for the piston. If you’ve ever accidentally twisted a twisty thing and gotten ink all over the place, you know what I’m talking about here. 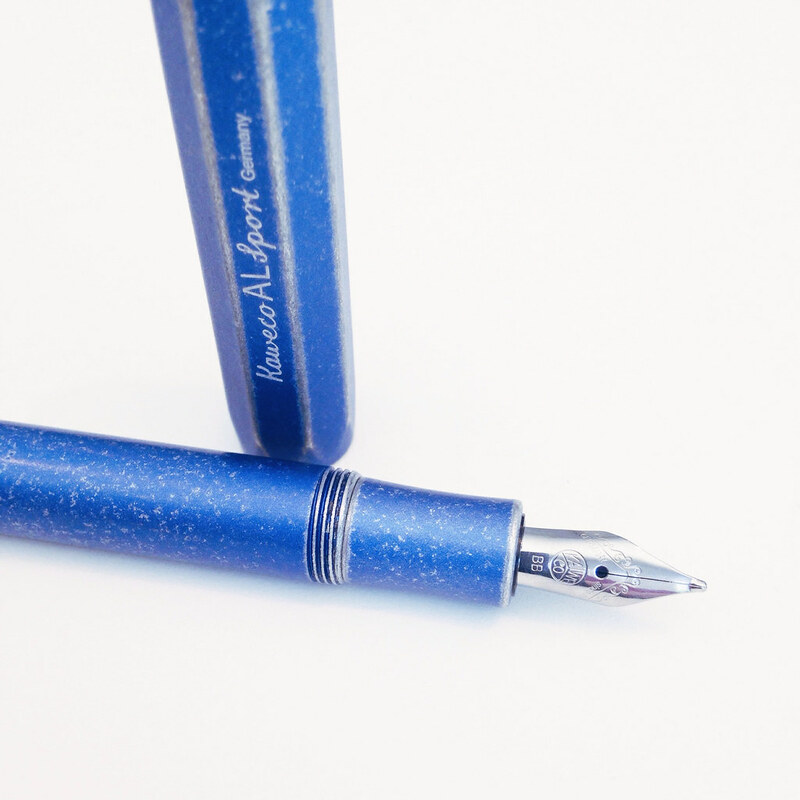 The Nib Creaper is super-slim and has a great ink window – stylish and functional. I love the way they look. It started out so well, but quickly became inconsistent. In the image above, it’s easy to see that the writing is darker at the top of the page and lighter as I near the end of the top paragraph. There were also some hard starts. The flow just wasn’t right. You know what makes me crazy? 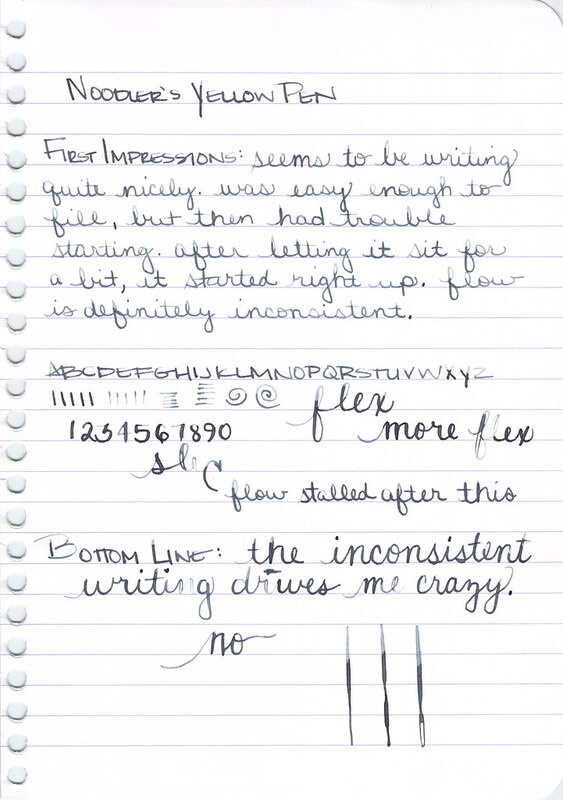 Inconsistent fountain pens. Work or don’t work, darn you! Let’s look at the blue version . . .
OK! Alrighty! 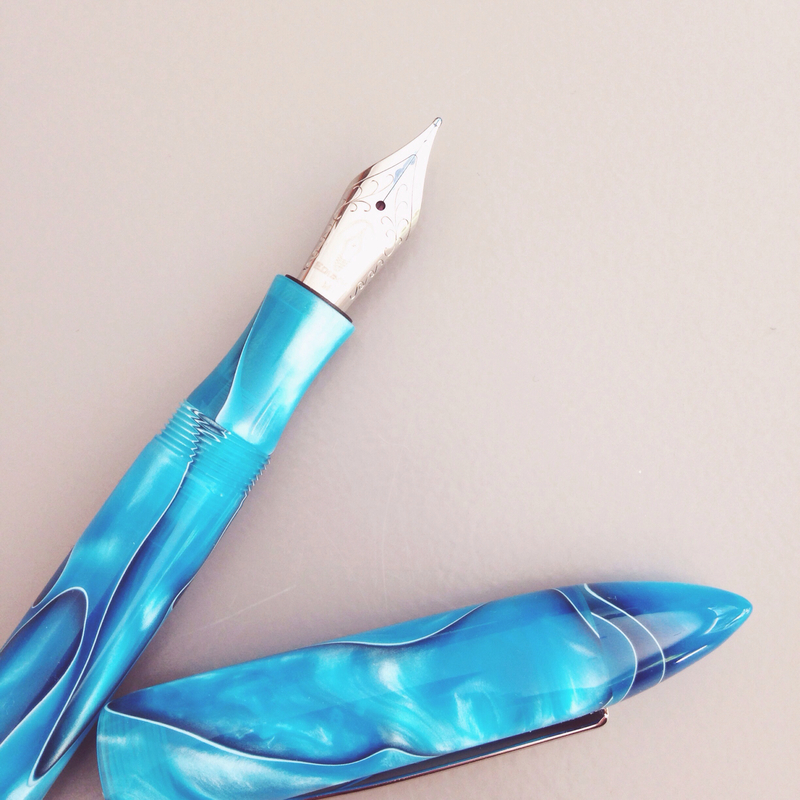 The blue Noodler’s Nib Creaper (why is it named that??) is kind of nice! 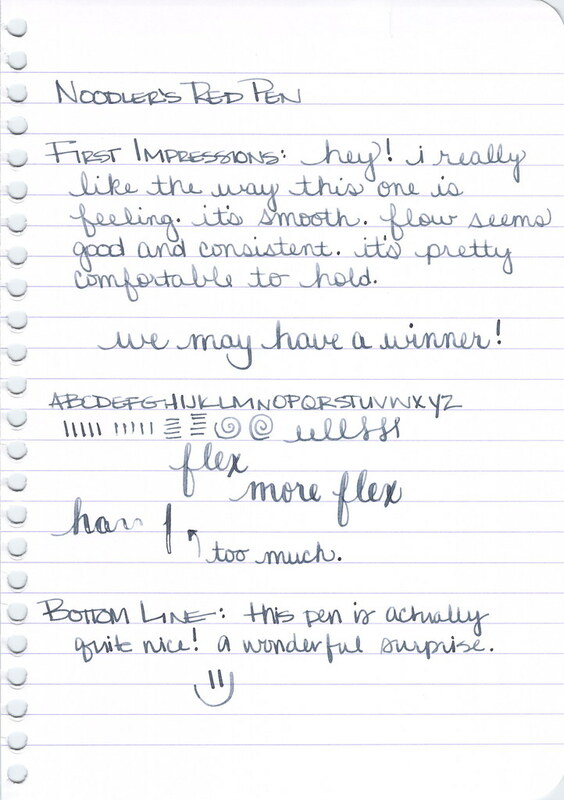 It writes, it’s fairly smooth a bit of happy feedback. It flexes! And it recovers quickly from railroading – very nice! I’m going to call this one a win. 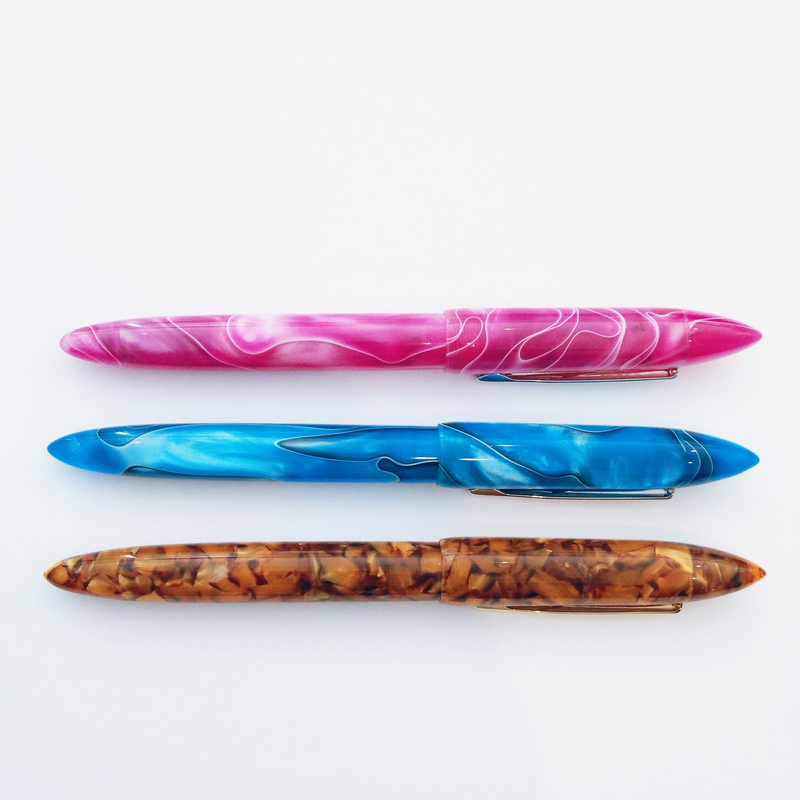 For those keeping score, that is one win out of three pens. Let’s keep going . . .
A black version of the Konrad Flex. Love that big ink window and, again, a blind cap protecting the piston’s twisty thing. 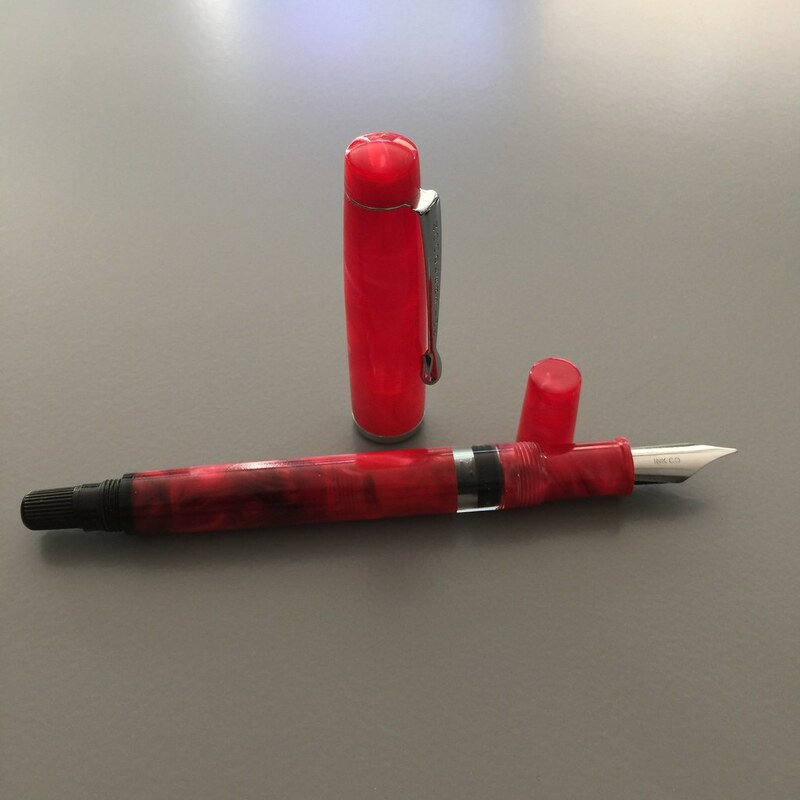 This pen wouldn’t take up the ink. I tried several times, several different ways. I took the thing out of the other thing, adjusted it a bit, and tried again. No go. Pretty sure the Ahab is the biggest of the Noodler’s pens. It fills with a plunger mechanism (fancy!) and looks like it could easily be converted to an eyedropper (but don’t quote me on that). 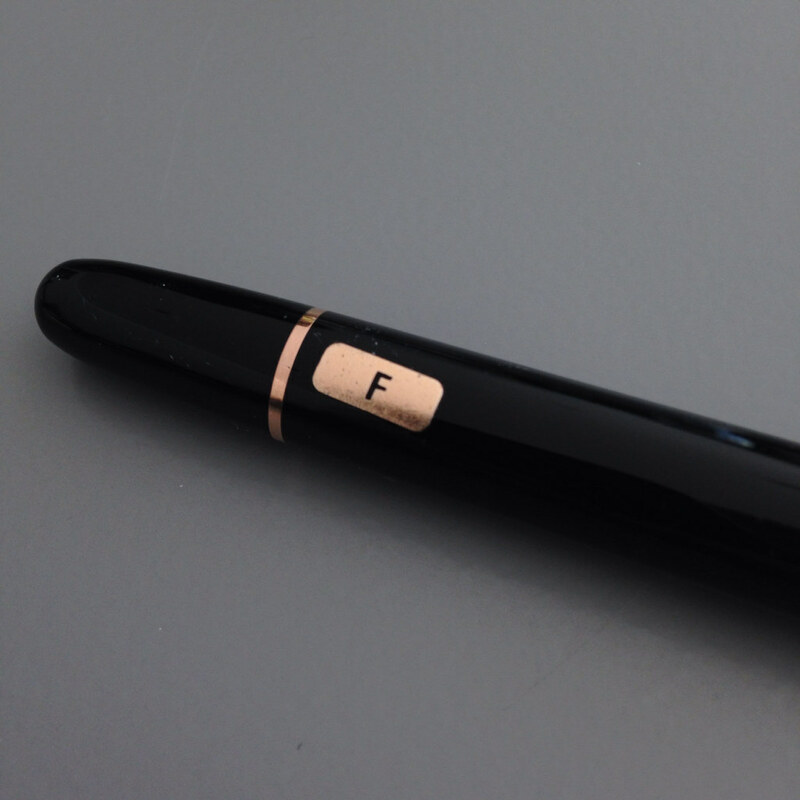 This is a pen I’ve reviewed in the past. 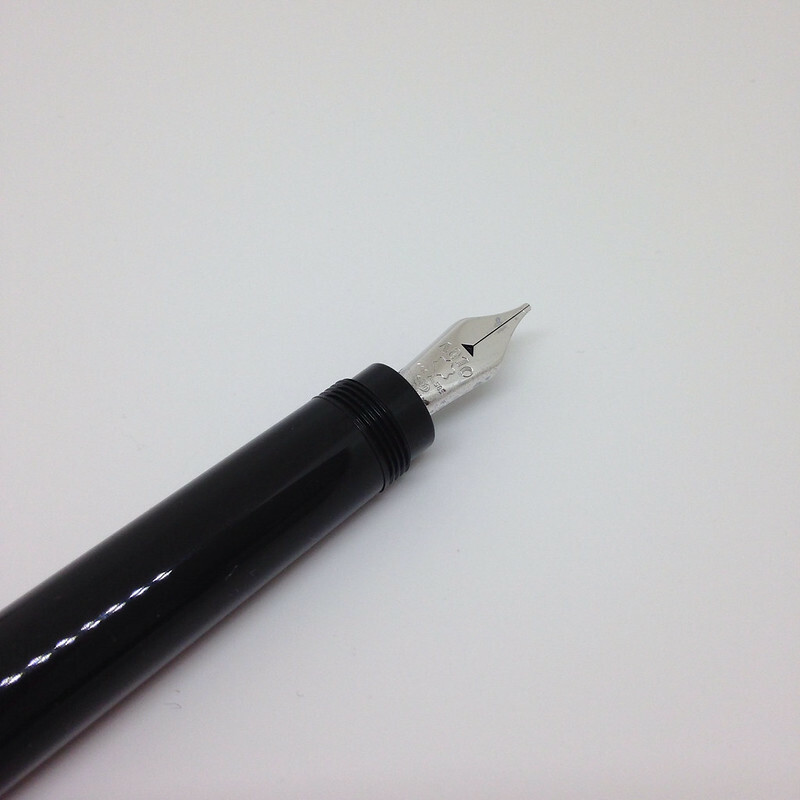 The Ahab wrote decently – until I started flexing the nib. Does it work as I’d hoped? No. What’s the score now? Is anyone keeping track? It wrote fine! Passed all but the hardest of the hard flexes. Seems like it recovered well from the over-flex. I like it! Thank goodness because it really is a looker. 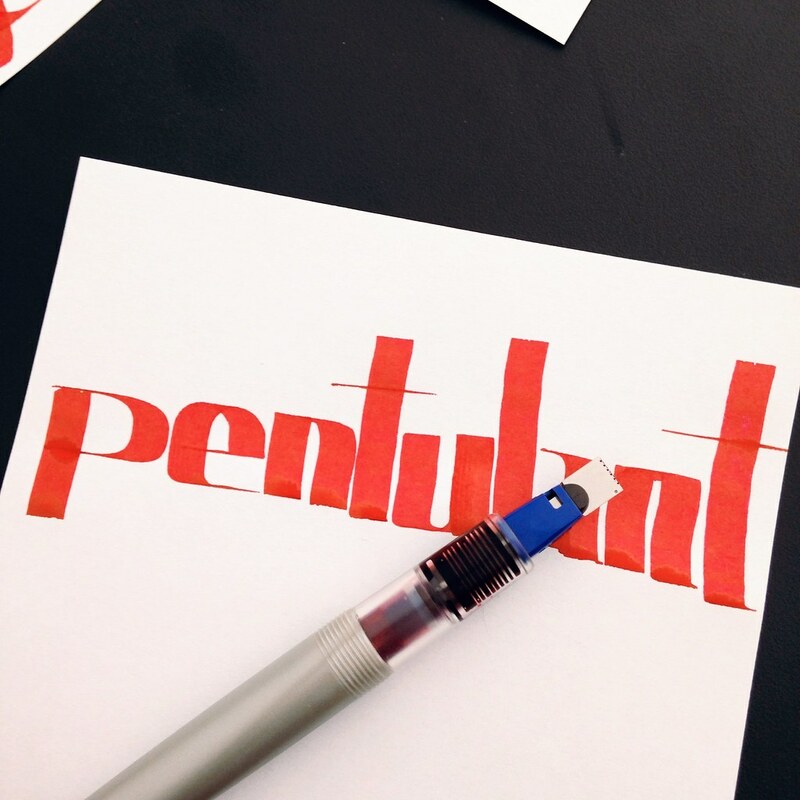 In fact, when Mr. Pentulant saw it, he asked, “Are you sure that’s a Noodler’s?” Ha! I set all of the pens aside overnight and came back to them the next morning. How’d they do? You’ll notice that the two pens that didn’t write the night before, didn’t write the next morning. No surprise there (especially since one of them didn’t have ink..ha). 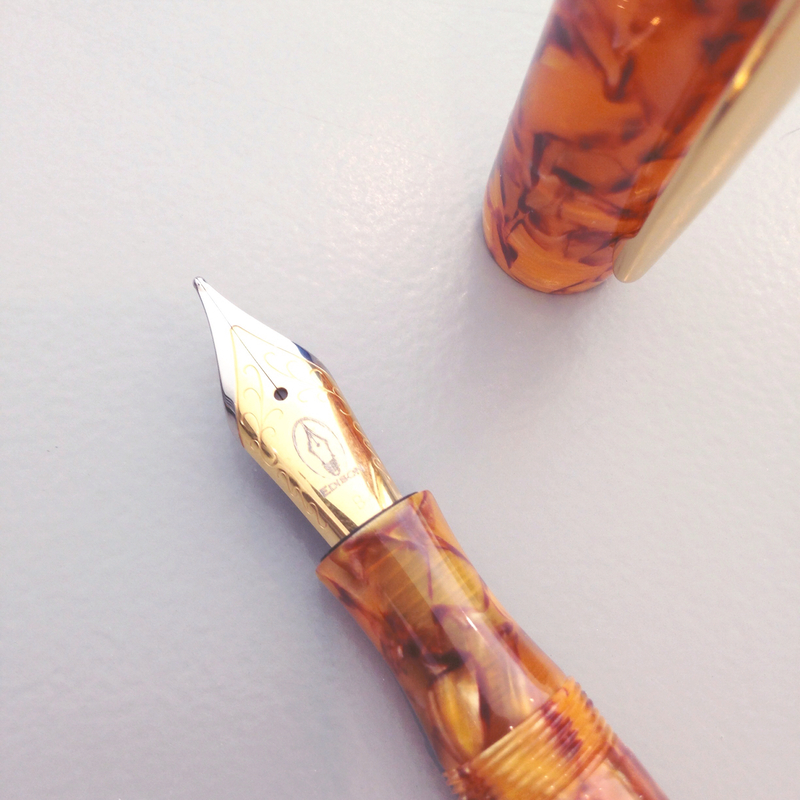 To the defense of Noodler’s for a moment . . . 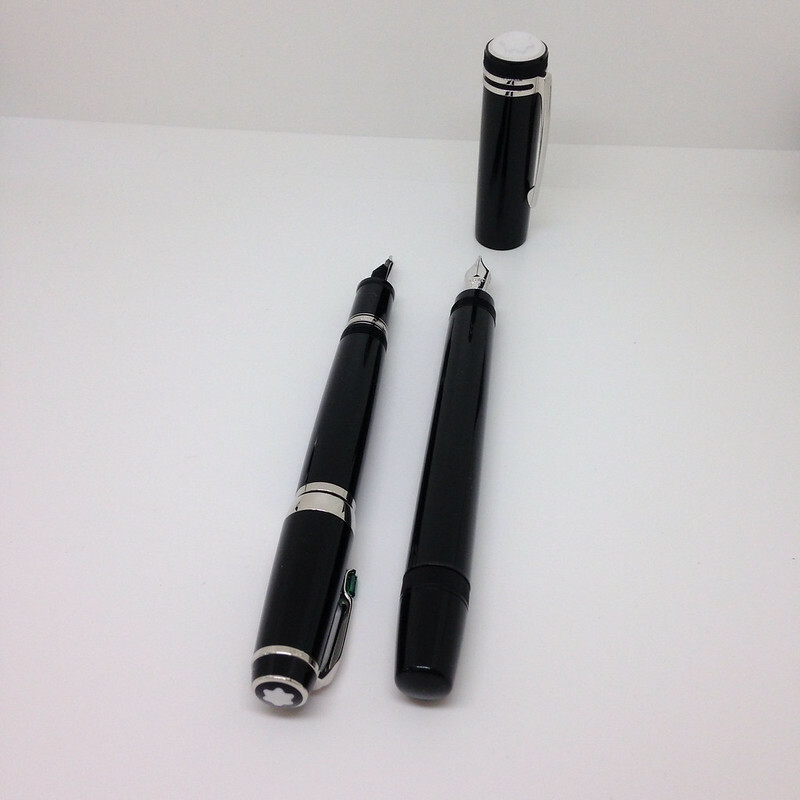 These pens are made to be tinkered with. If you’re a fiddler and you want to fiddle, maybe you’ll have more success than I have had. I watched Brian Goulet’s video. I tried. I freakin’ tried (and then blamed myself? no.). 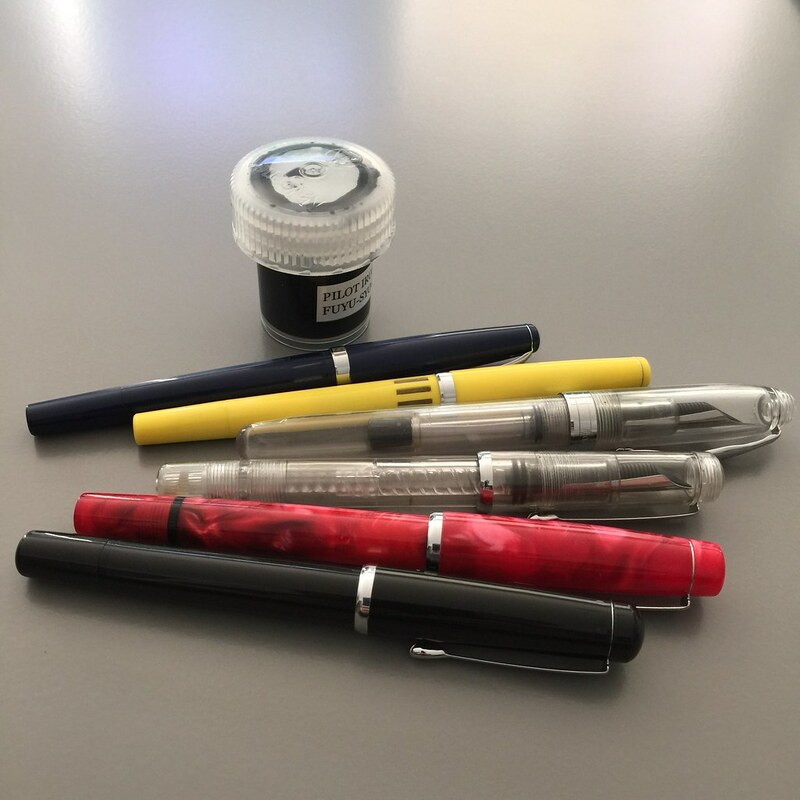 I have come to the conclusion that I’m willing to tinker a little, but I mostly just want my pens to write when I pick them up. You know? 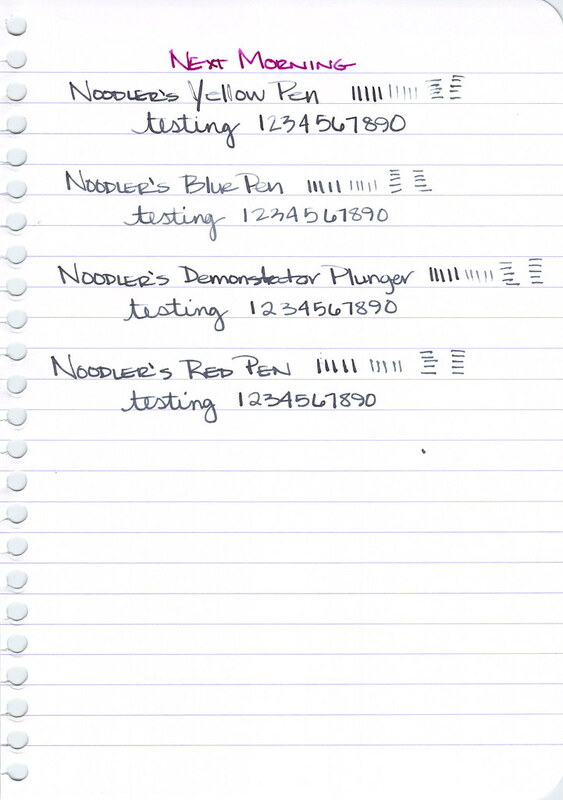 I’ve also concluded that Noodler’s pens are inconsistent as a whole. I wouldn’t be at all surprised if I went out to the living room, picked up the blue one, and it didn’t lay down a single line of ink. Likewise, that plunger-fill pen might just work today. And it’s that inconsistency that I cannot stand. 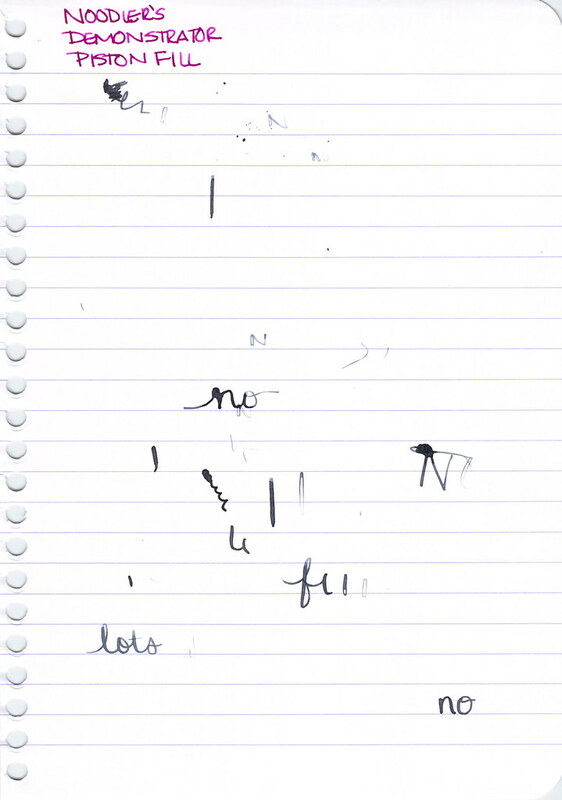 Noodler’s pens are not for me. 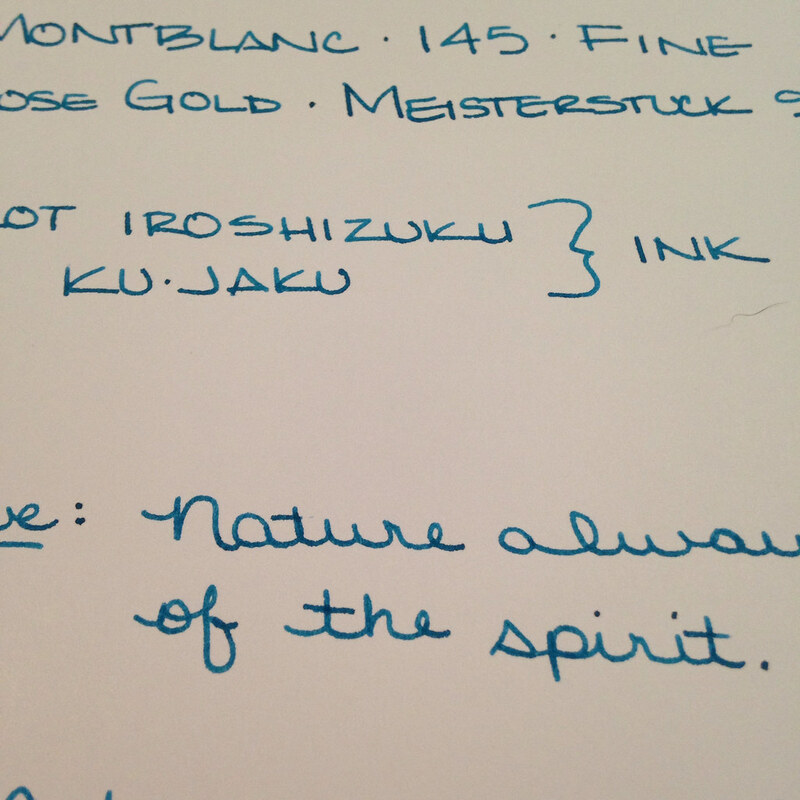 Noodler’s inks are a different story! OK, what do you think? 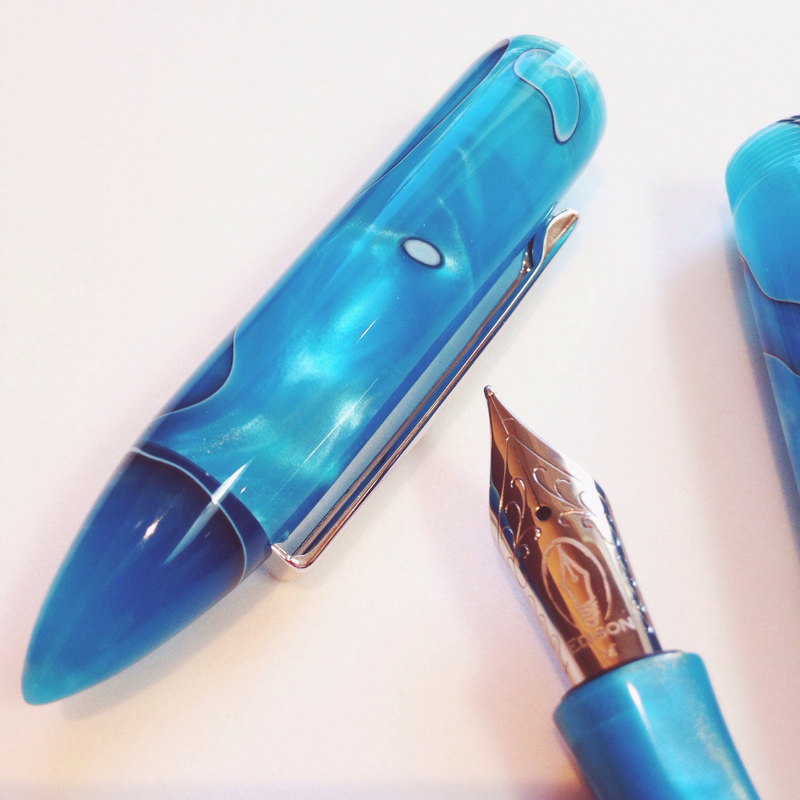 Noodler’s pens – love ’em or hate ’em? 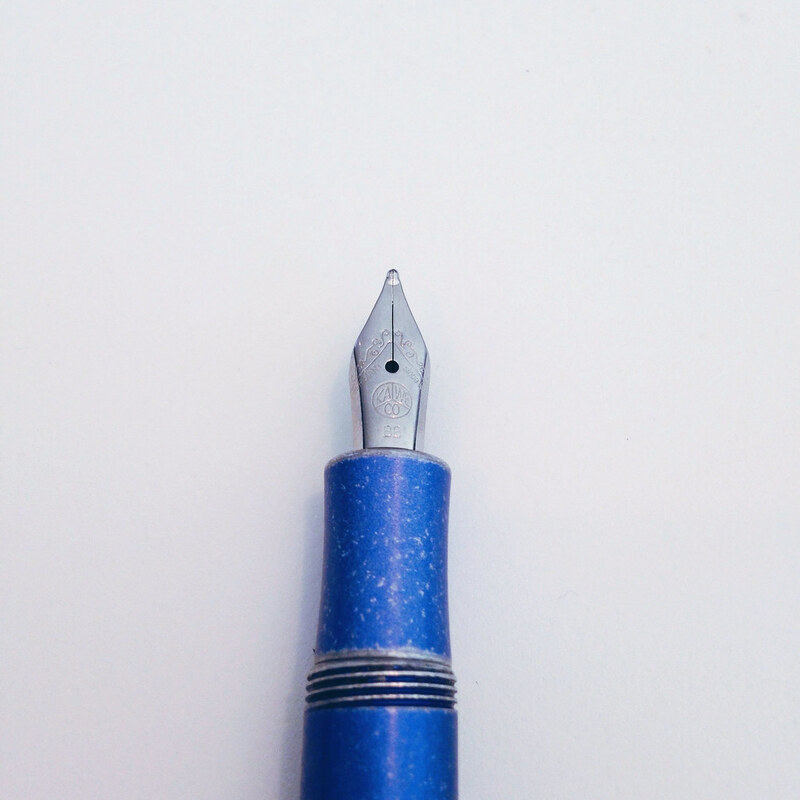 I’m just going to blurt it out: I love this pen. 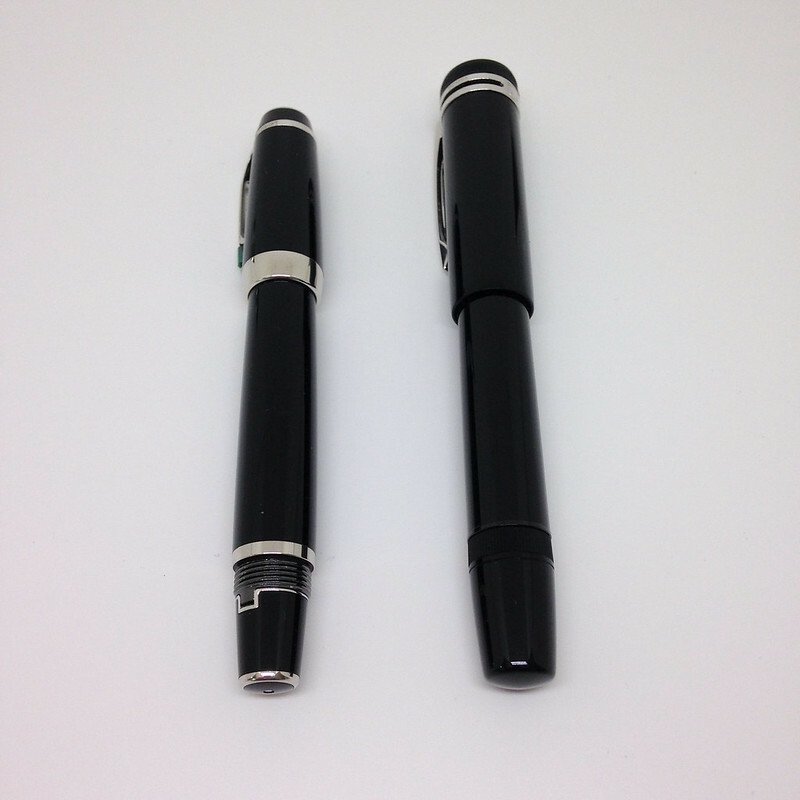 I have two Pilot Parallel Pens – around ten bucks each, yo. 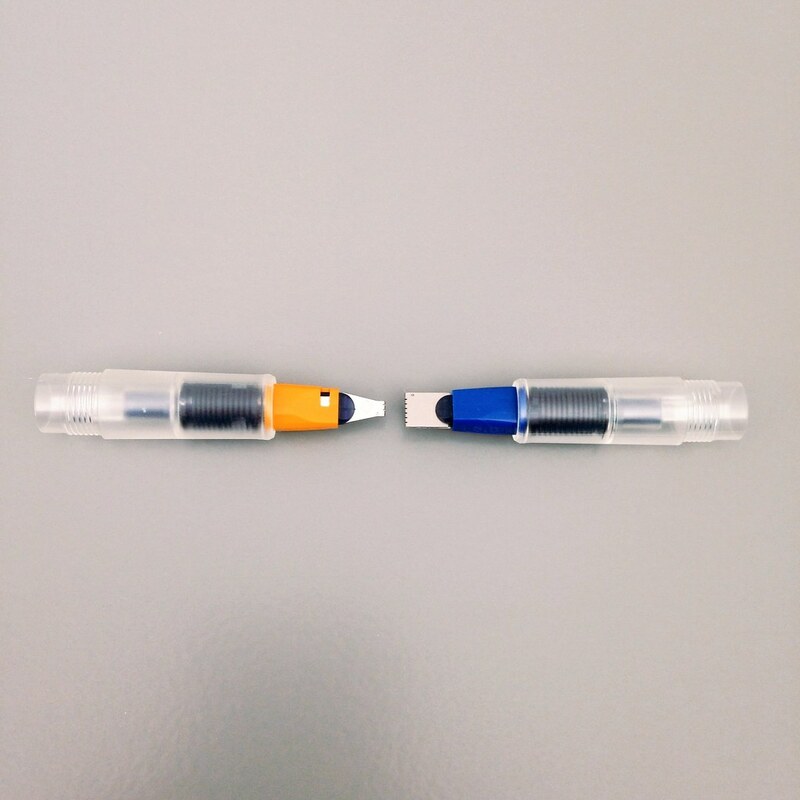 I opened and played with both, but only inked the blue 6mm version. 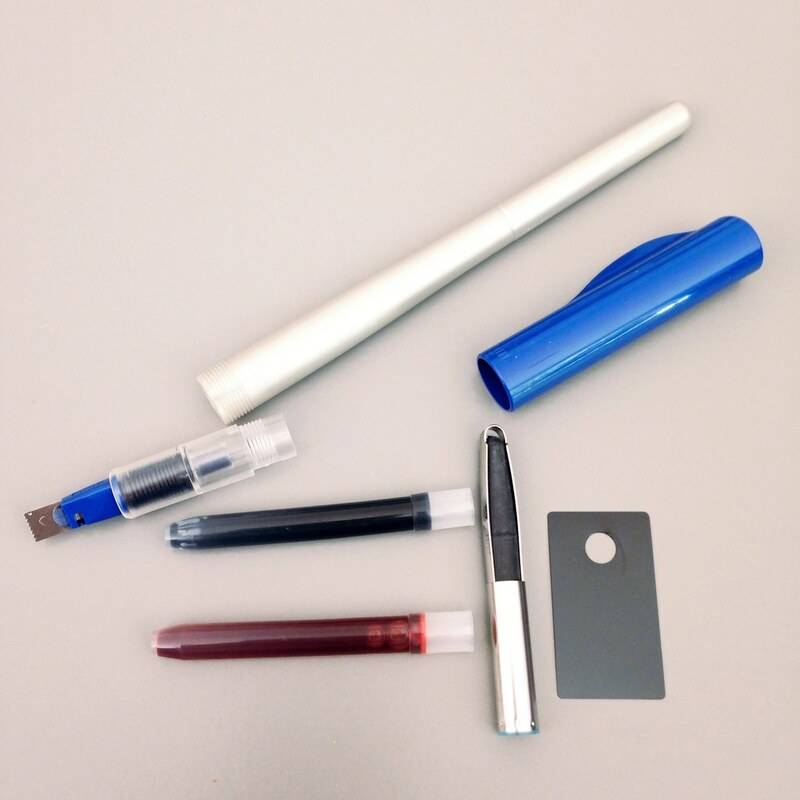 Above: The pen comes with two Pilot proprietary ink cartridges (one red, one black) and a converter. 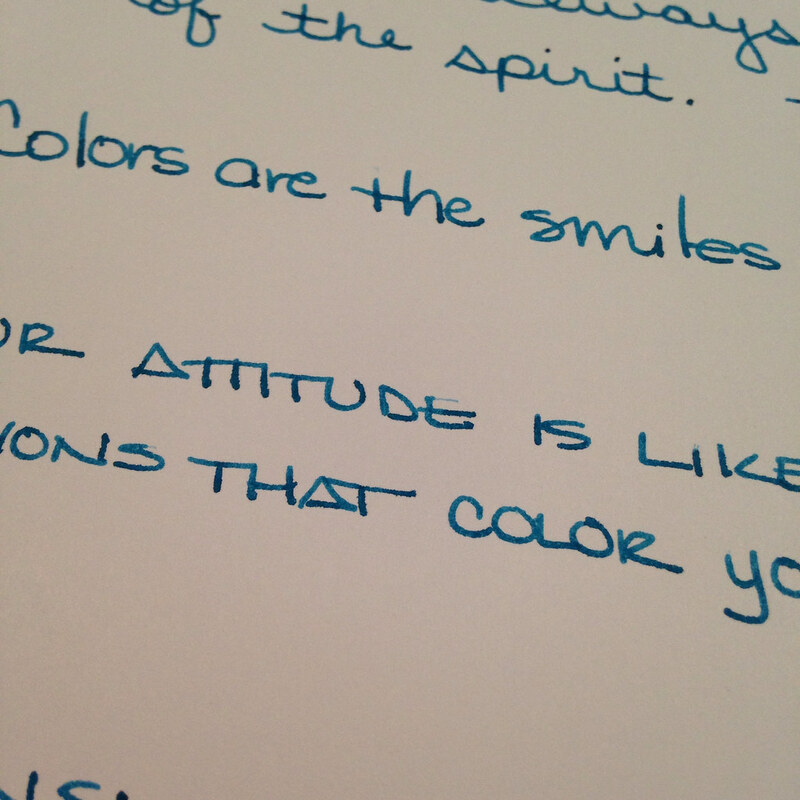 These inks are mixable. I don’t get into it here, but Rachel Goulet has a terrific video that you should watch. Converter? 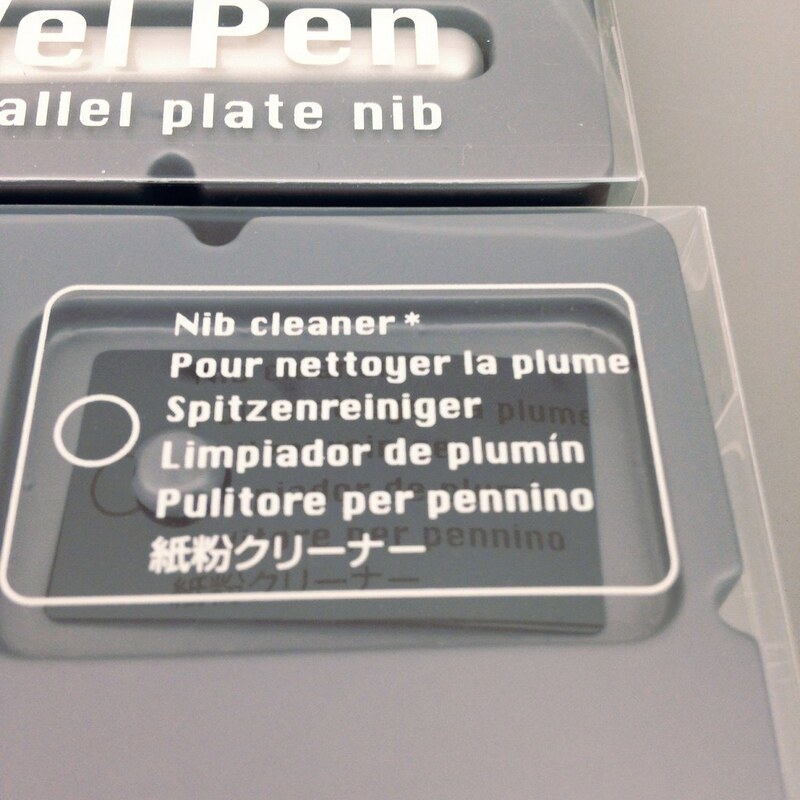 For cleaning the pen unit? Huh? What the heck? While I don’t know yet if it will help with cleaning, I am sure that the converter cannot be used for ink. 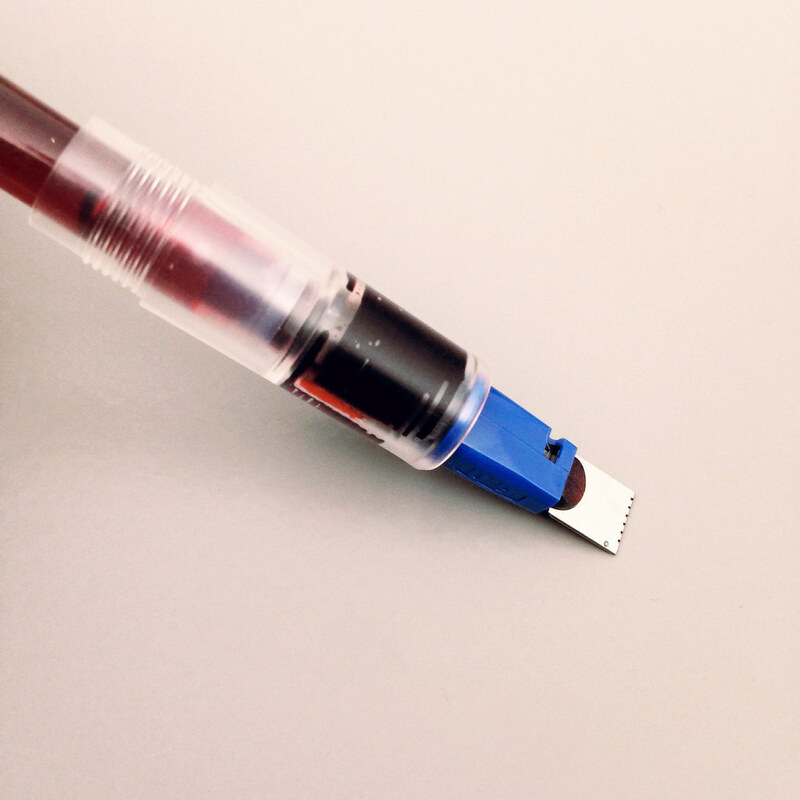 The seal is not nearly sufficient to keep ink in the converter. Strongly suggest not trying it, but please take pictures if you decide to go for it – I love a beautiful mess. 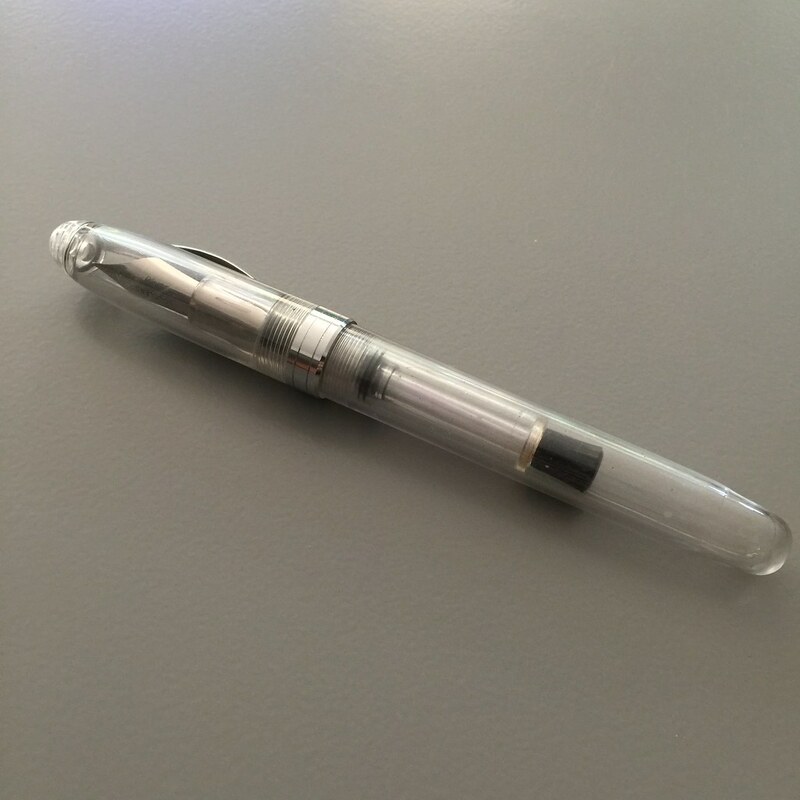 My understanding is that the Pilot CON-50 converter will work with this pen. I plan to find out. 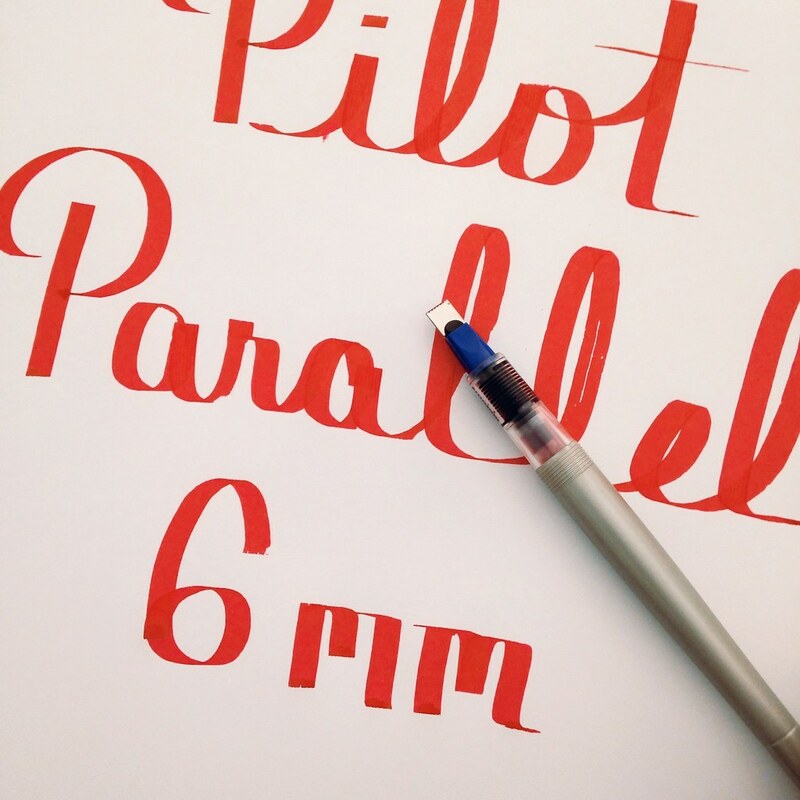 Because, really, imagine big fat shaded or sheen line? 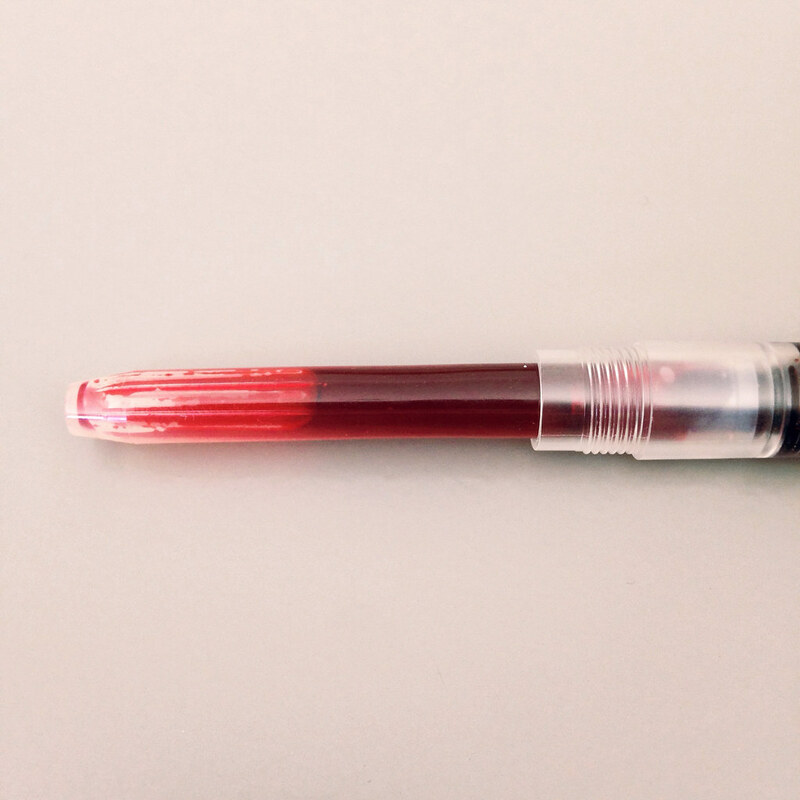 Oooh…or maybe Diamine Flamingo Pink? 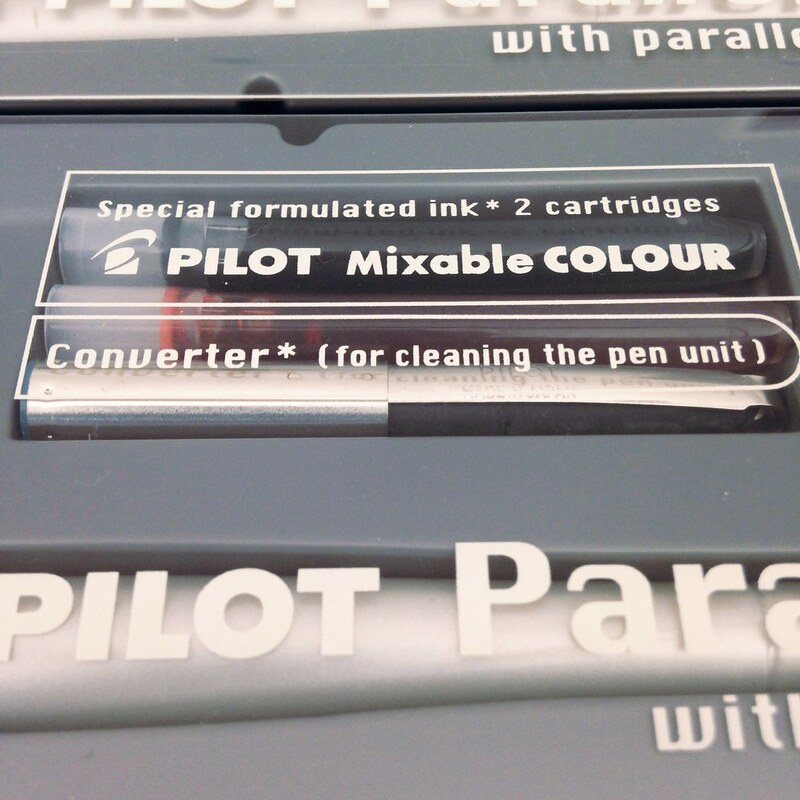 The Pilot Parallel also comes with a handy Nib Cleaner (it’s a piece of film that slips between the plates of the nib) and a somewhat informative instruction sheet. I love this picture – the reflection of my yard, my fingerprint – what’s not to love. 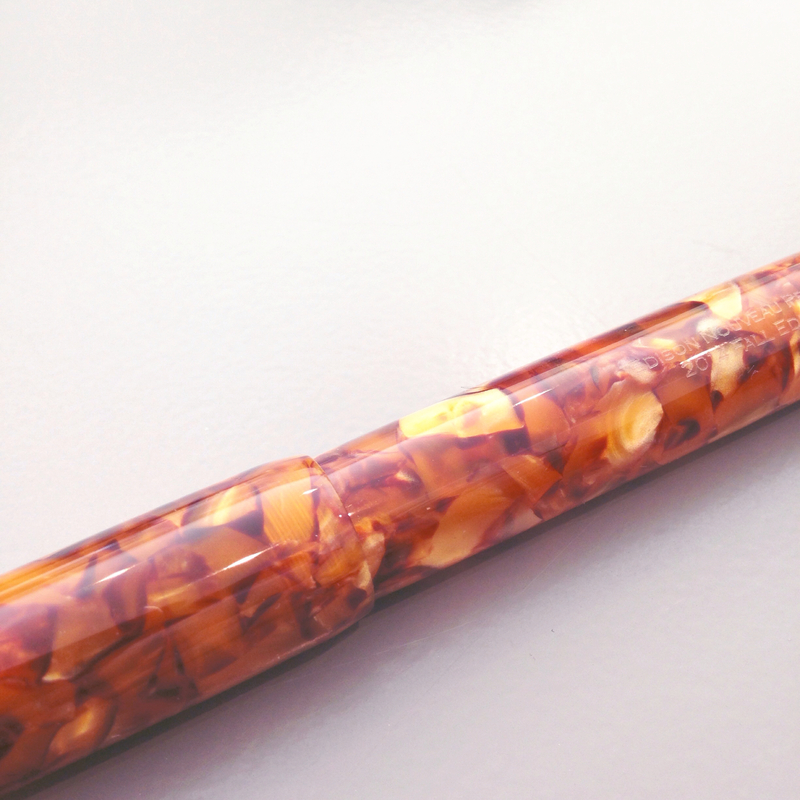 It’s a fun pen. 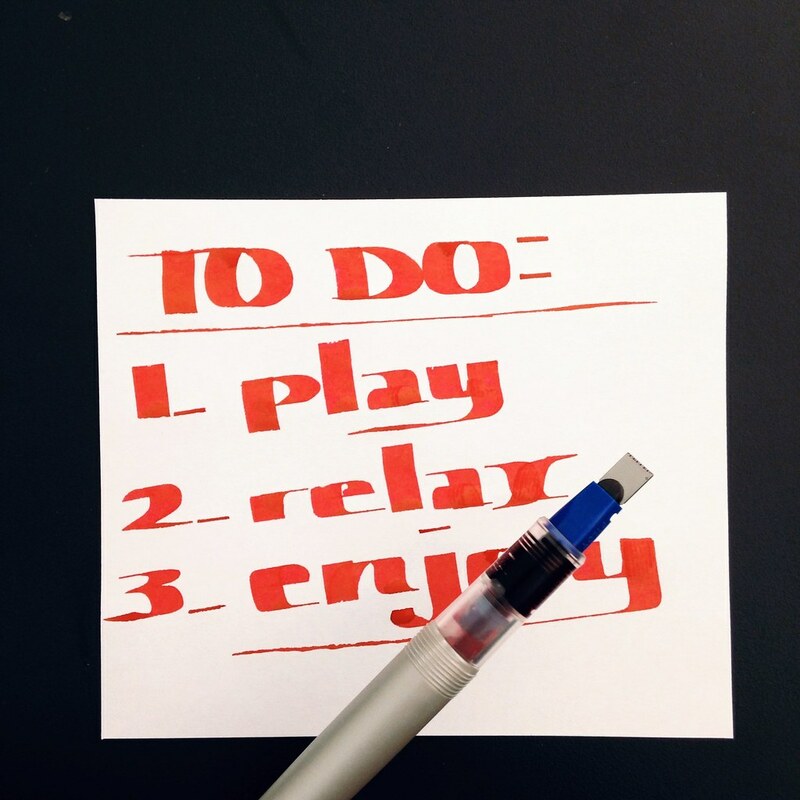 For regular use, I might change the ink to a bright yellow and use it a highlighter. Fun, yes? doesn’t come with a converter that can be used for ink – arrrgh. 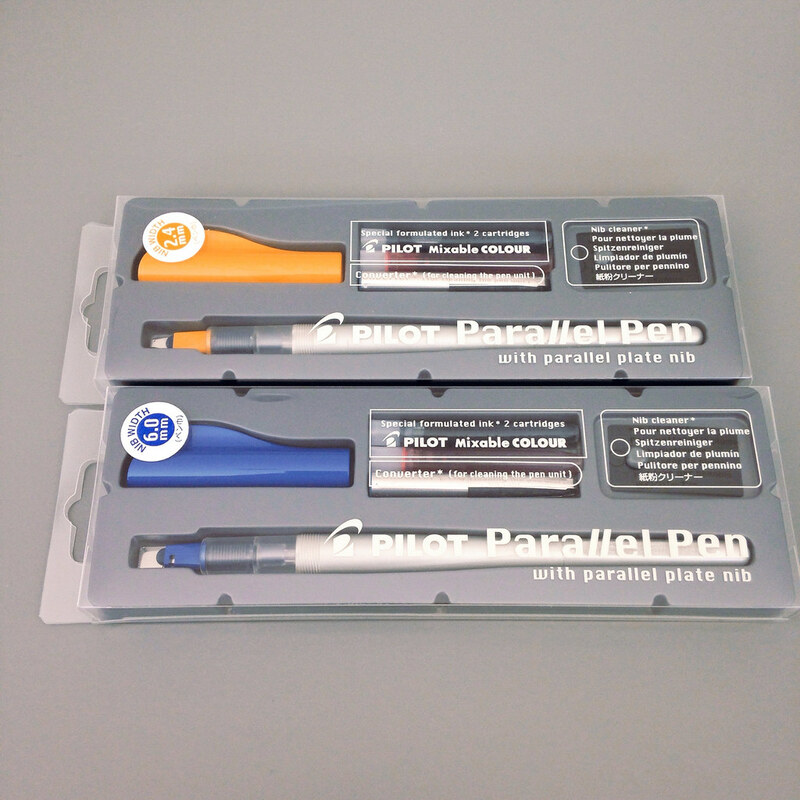 One of my Pilot Parallel pens came from Goulet Pens. The other came from Jet Pens. 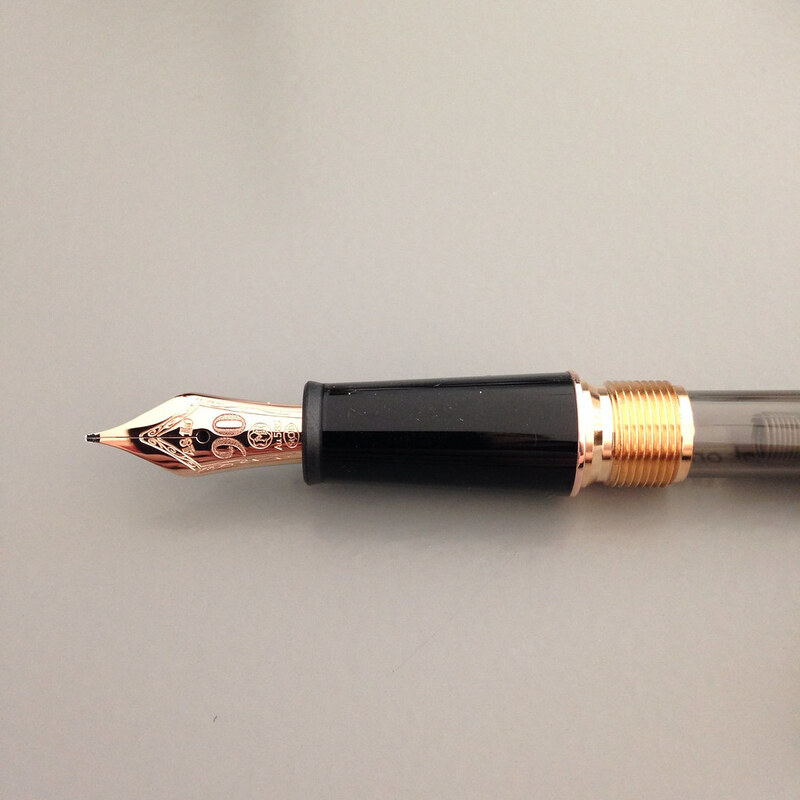 Goulet’s price is less. Bought and paid for with my own pennies out of own piggy bank. 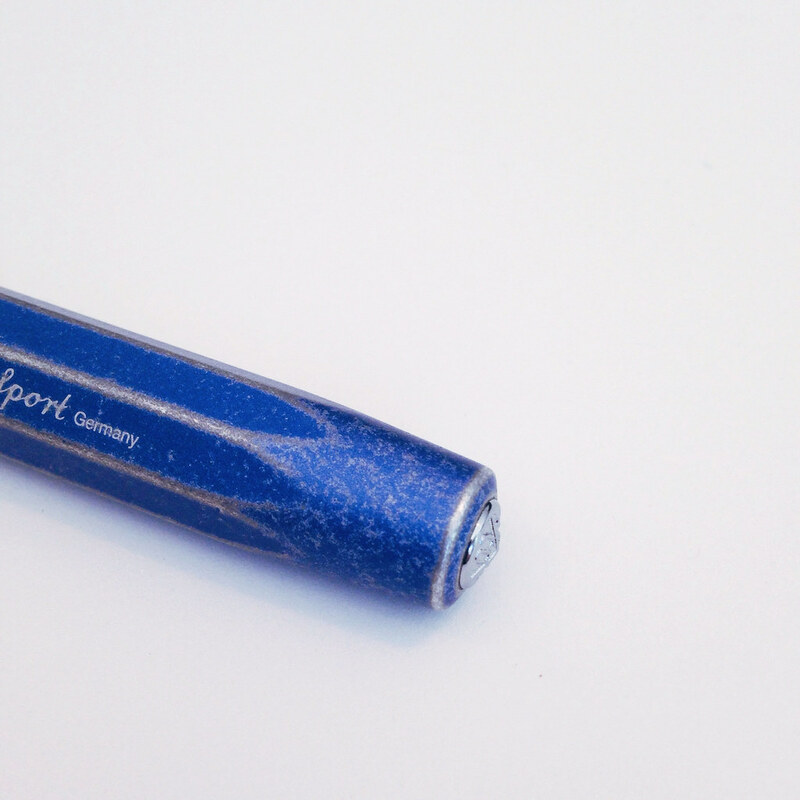 I’ve been calling this the Kaweco Stonewashed AL-Sport and have seen others refer to it as the Kaweco Raw AL-Sport. I’m usually not into the weights and measures of my fountain pens, but I can’t help it this time. 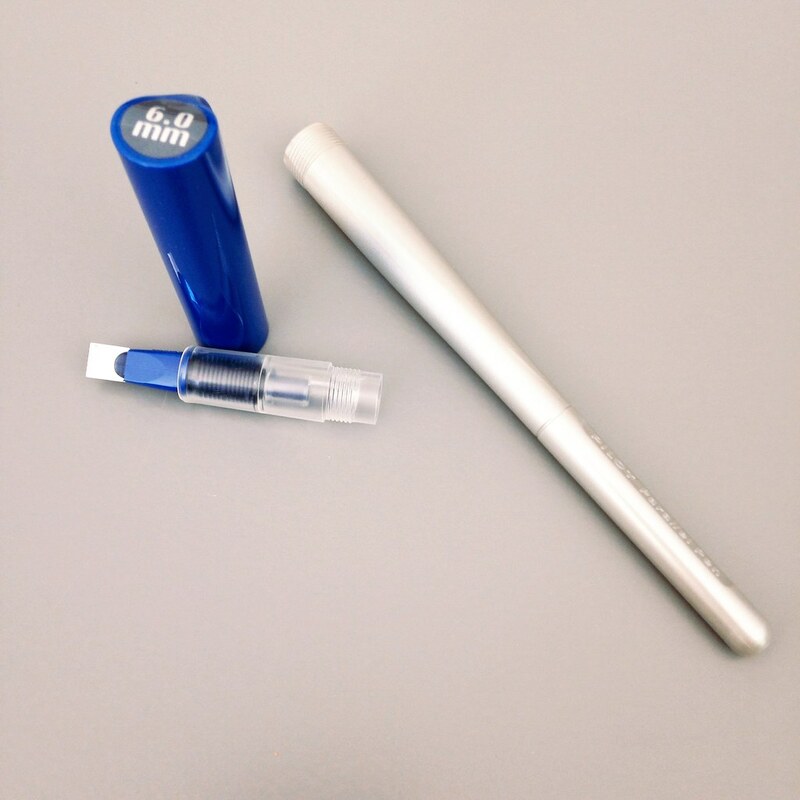 Capped, this great-looking pen measures right around four inches – the perfect size for pockets or smaller bags. 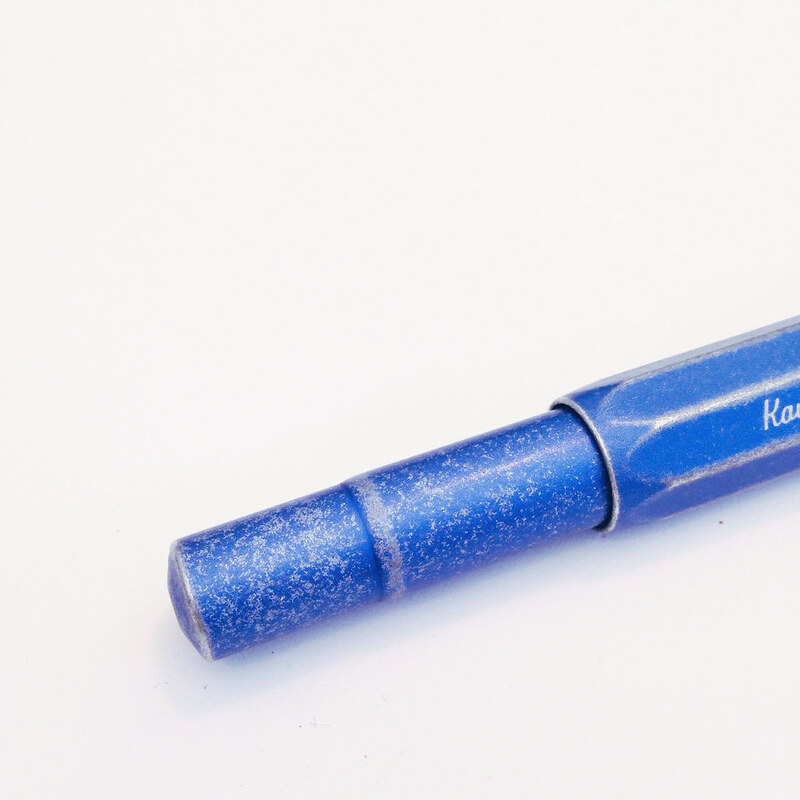 When posted, the Kaweco gains over an inch to just about 5.25 inches. Perfect. The AL Sport weighs in at a solid 22g. 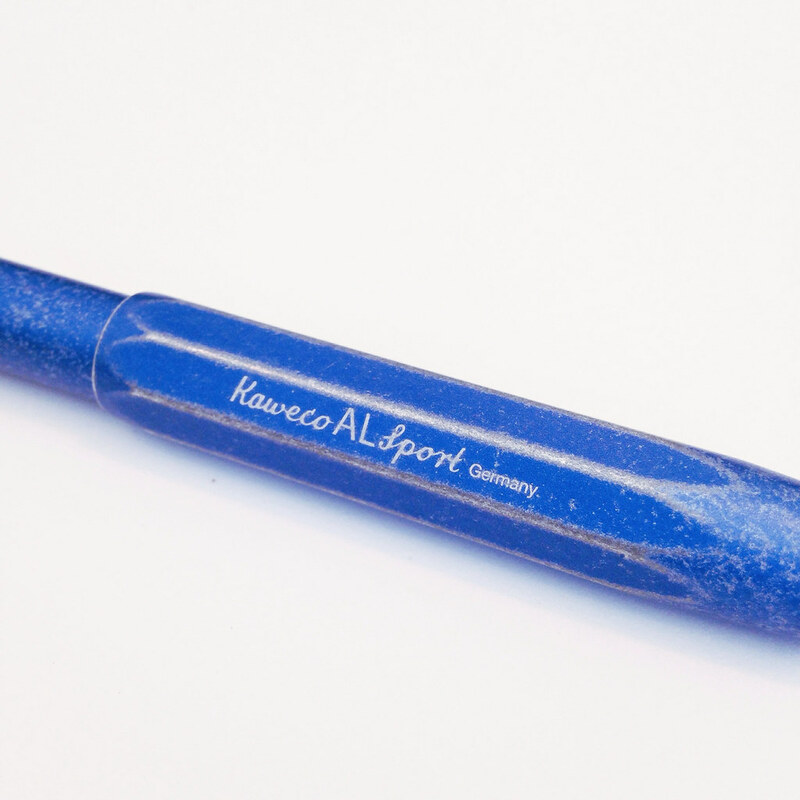 For comparison, the Kaweco Ice Sport weighs just 10g. I love the look of this pen – classic Kaweco design, sleek, simple, smart. The color of is simply called grey. It’s a very warm grey – leaning well into red. Lot of depth of color for what is basically a flat finish. 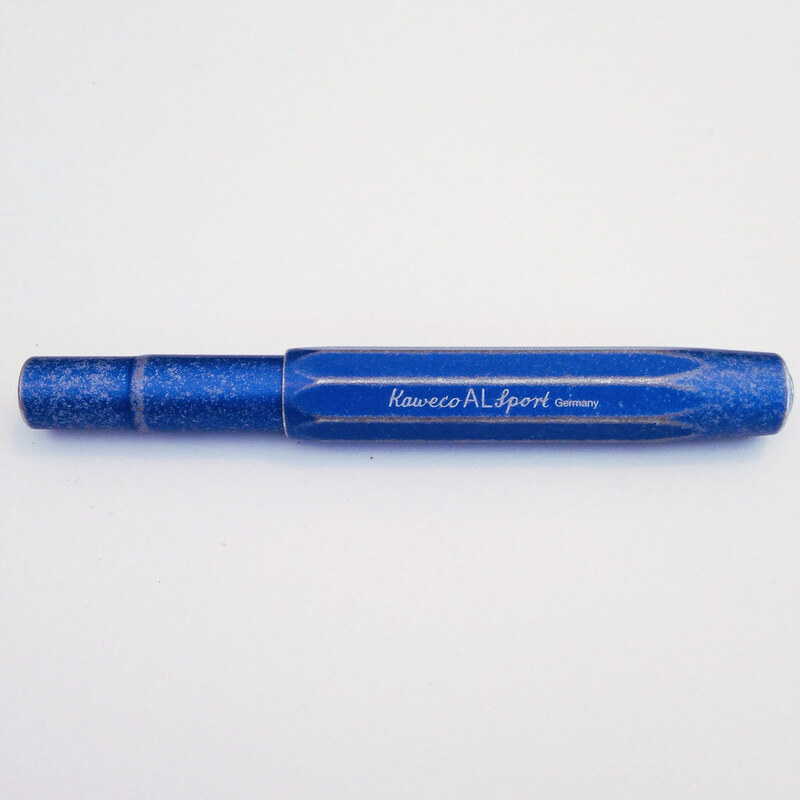 I can’t help but think that if you wanted to match this pen to an ink, you should try Pilot Iroshizuku’s Kiri-same. Unfortunately, this pen only accepts short international cartridges. 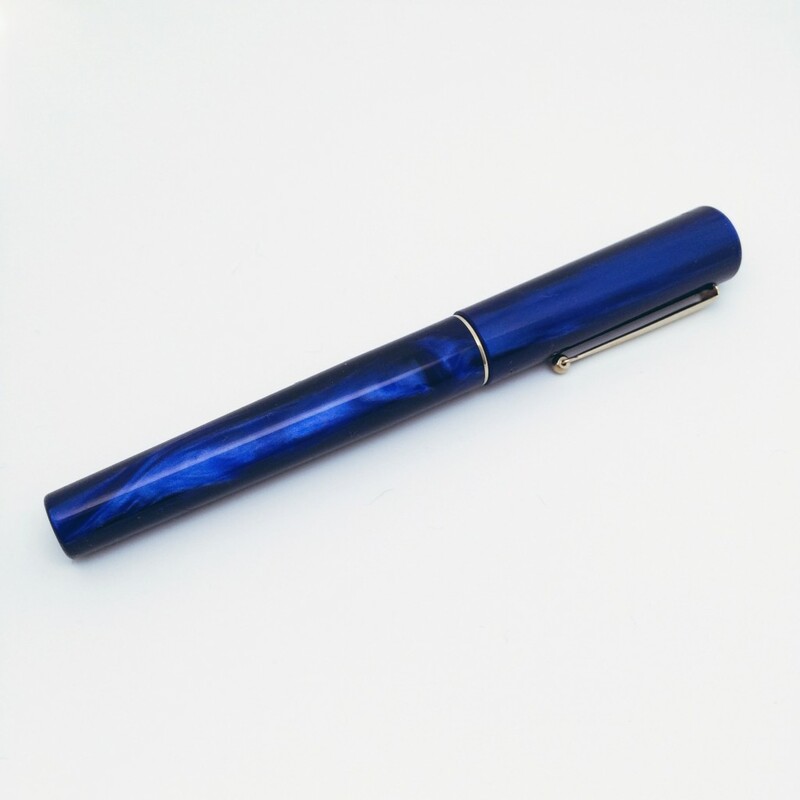 Fortunately, some short international converters may work with the pen. Unfortunately, I don’t know which those are – I am hoping someone will post with suggestions. 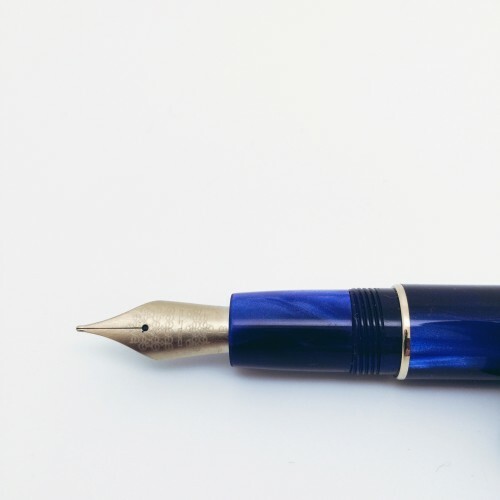 I loaded up my medium-nibbed AL Sport with a Private Reserve Spearmint cartridge and got to writing . . . .
My early (and only) concern was that the section (grip area) is quite short and my thumb was hitting (and rubbing against) it oddly. Honestly, I wasn’t sure it was going to work out. After writing with it for awhile, putting it down for a day or two, and then going back to it, there were no issues with the section/grip. Whew. Perfectly comfortable, but something to be aware of because that section does seem short. 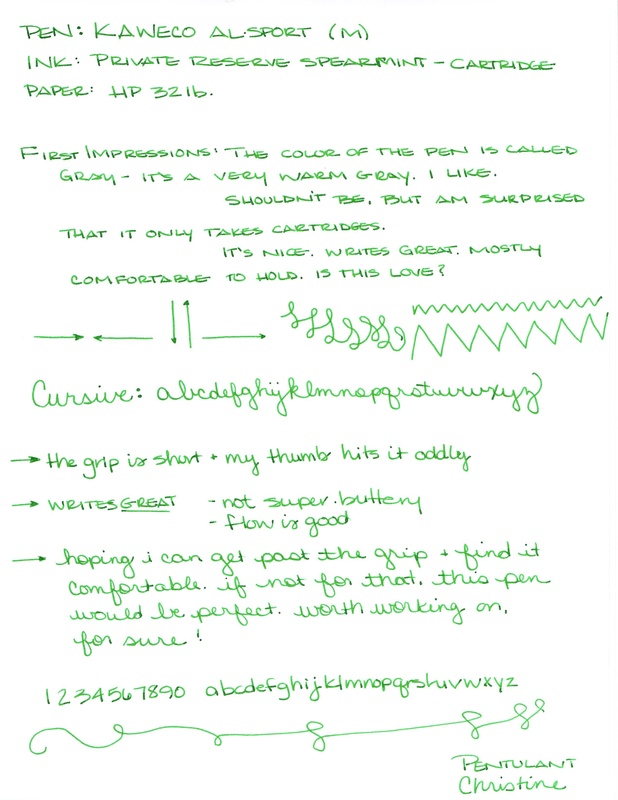 Click here for full-sized writing sample (it’s big). My bottom line . 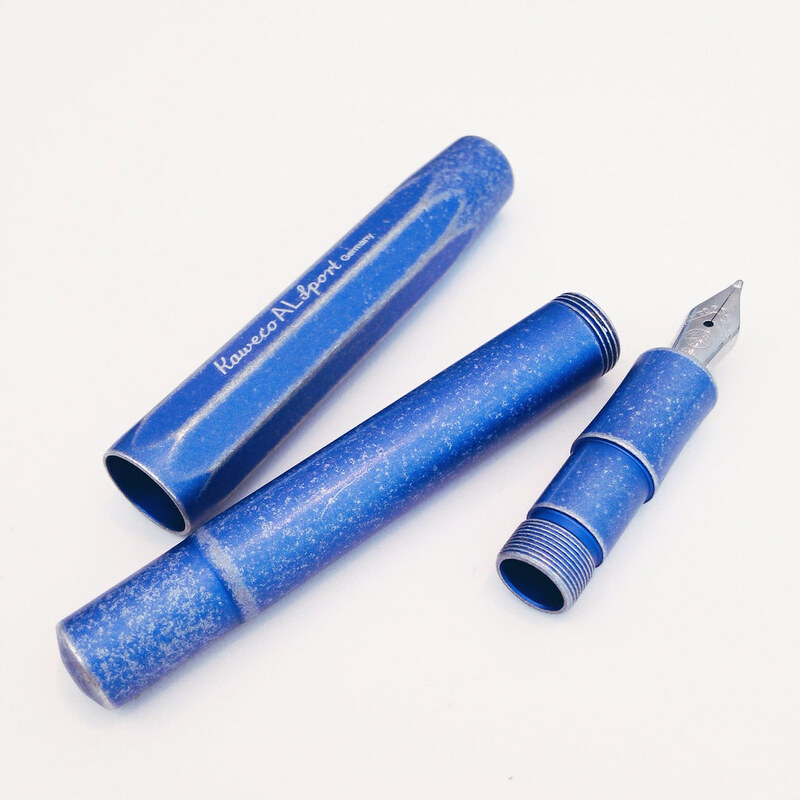 . . At around $80 (I got mine from Goulet Pens with my own saved pennies), it’s a bit more expensive than some of the other Kaweco fountain pens, but the quality is there. Definitely recommended. 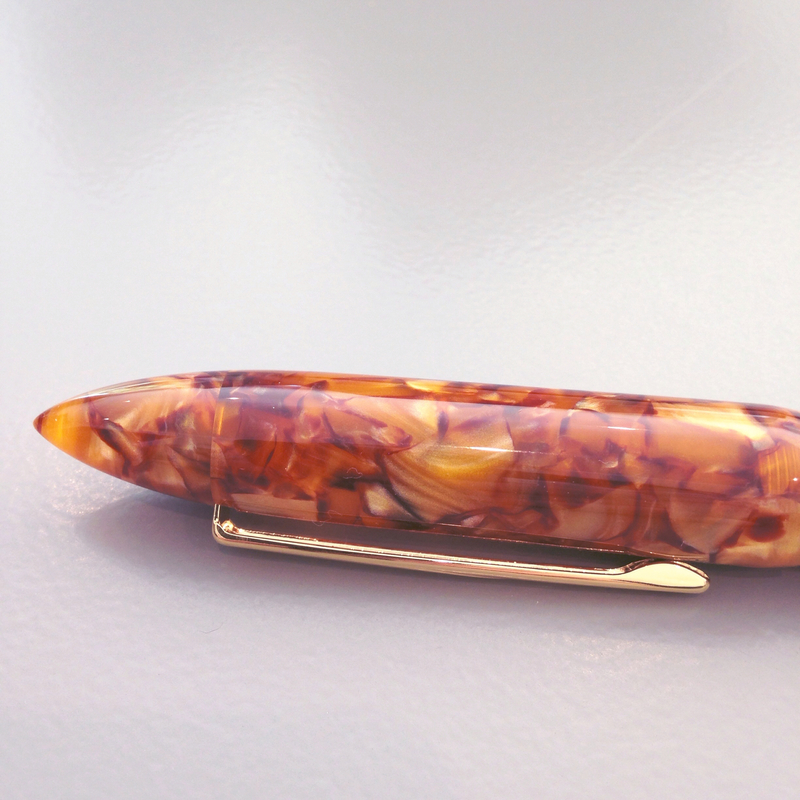 In fact, I’m already looking for the Stonewashed version of this same pen – stay tuned! As soon as the mail carrier knocked quietly on the door (she doesn’t want to disturb the dogs…haha), I jumped up because I knew what was going to be on the porch waiting for me. 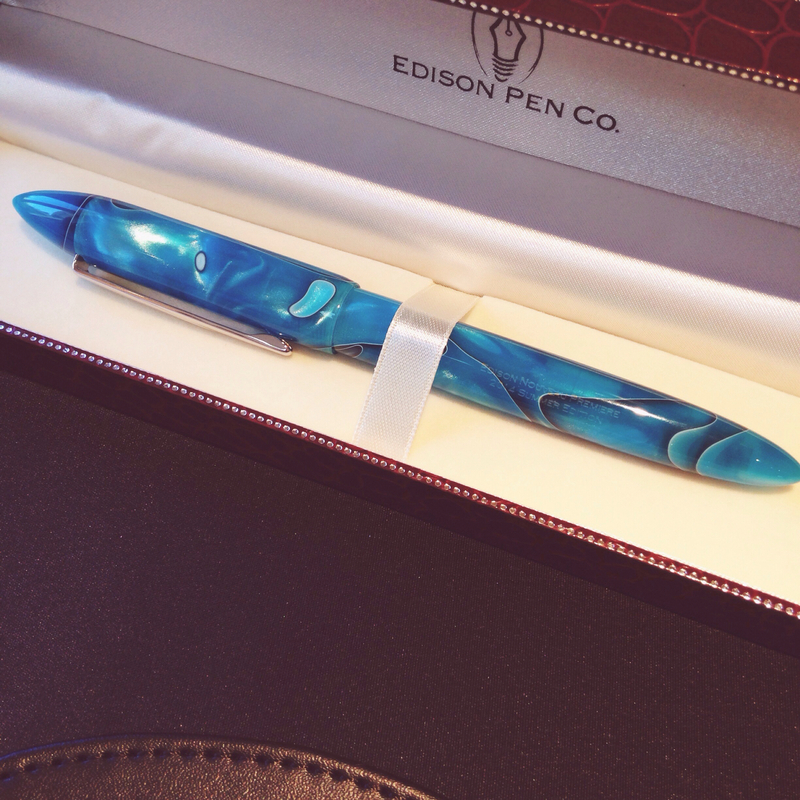 Days before, I’d seen the preview and knew I was going to own this pen – the Edison Nouveau Premiere – Caribbean Sea (Summer Edition 2014). I have its Cherry Blossom – Spring 2014 sister. And I practically squealed when I saw the color of the Caribbean Sea. So..that’s the disclaimer, I received this pen at no charge to me and I’m being totally honest about what I think of it. 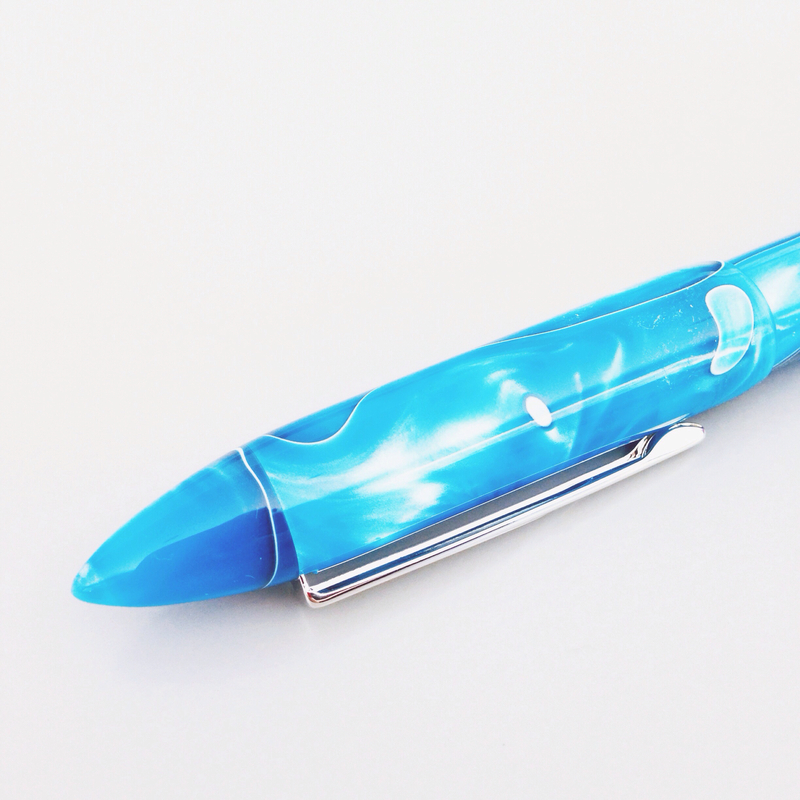 The name of this pen is perfect – Caribbean Sea. The color is a gorgeous blue-green with lots of depth, swirls, and sheens. I couldn’t stop taking pictures of it from different angles, in different light, on different surfaces. If you like the way it looks in my (very amateur) pictures, you’ll love the way it looks in person – seriously. The shape of the Premiere is . . . interesting. It has the pointiest cap ever. 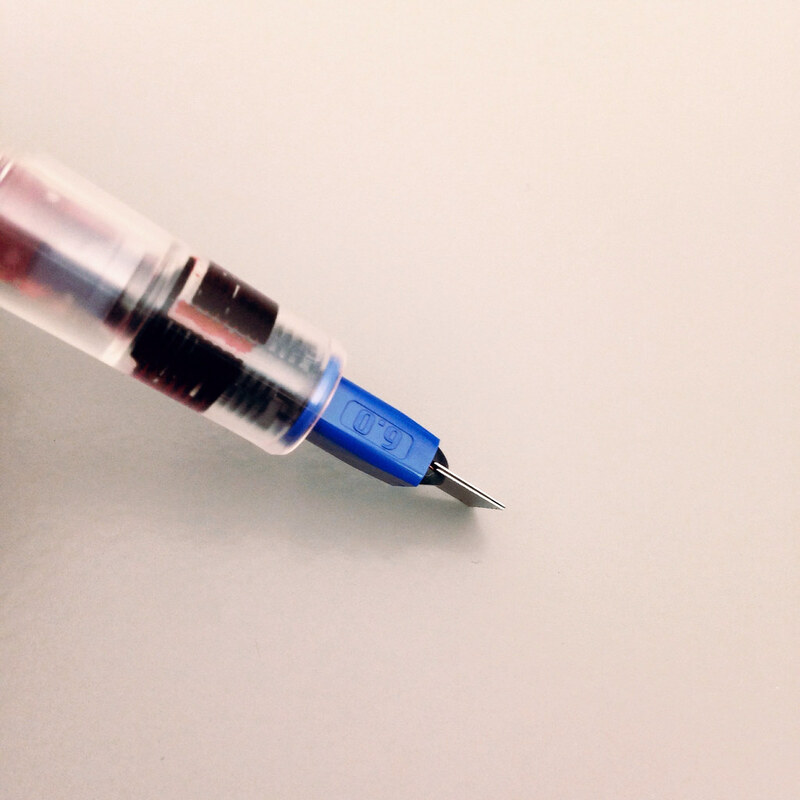 In fact, I challenge you to find a pen with a more pointy cap. I love that the section (the part you grip) is contoured and there is no steep drop-off between it and the body of the pen. It’s very comfortable in the hand. The cap can be posted, but I’m finding that I like writing with it unposted better. 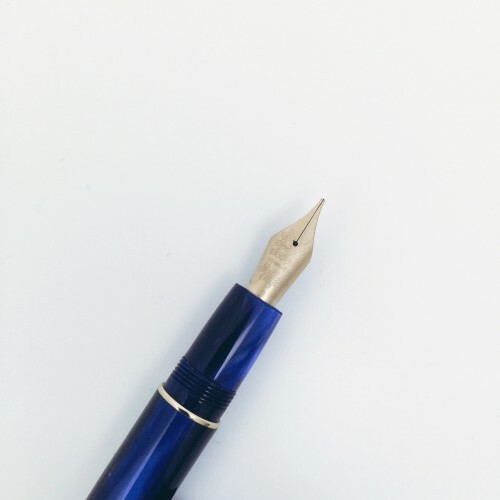 It’s definitely not a weight issue – more that the pen is longer than average when posted and that may take some getting used to. 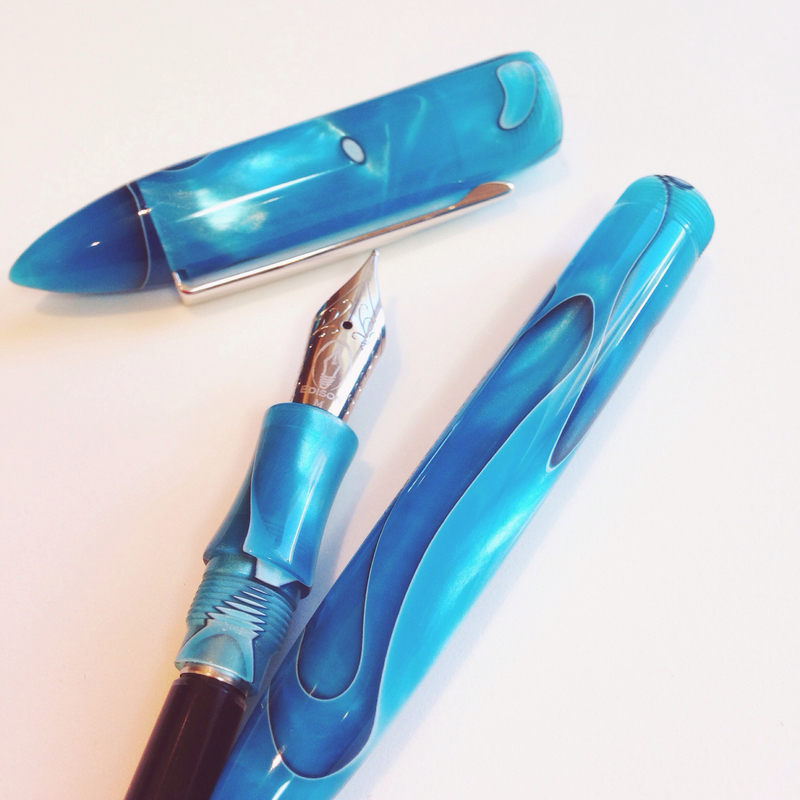 Of course, looks are only part of the equation when it comes to fountain pens. How does it write? 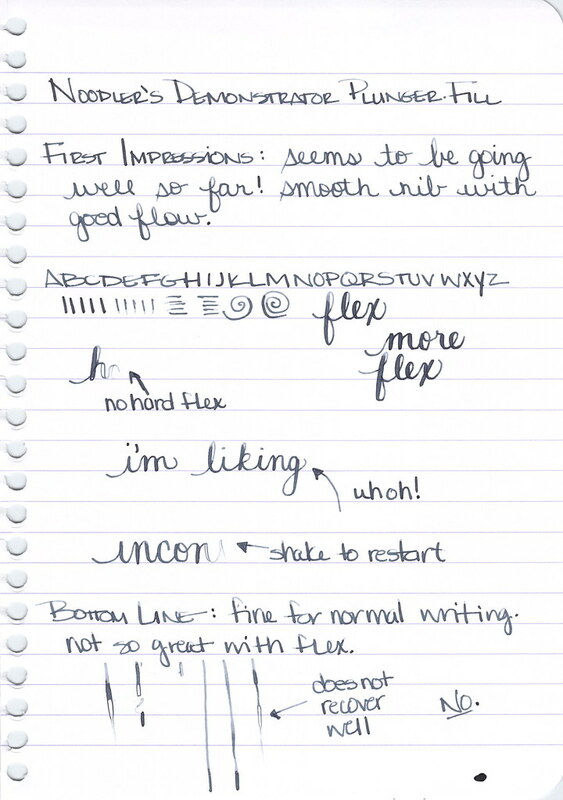 Here are some scanned handwriting samples. 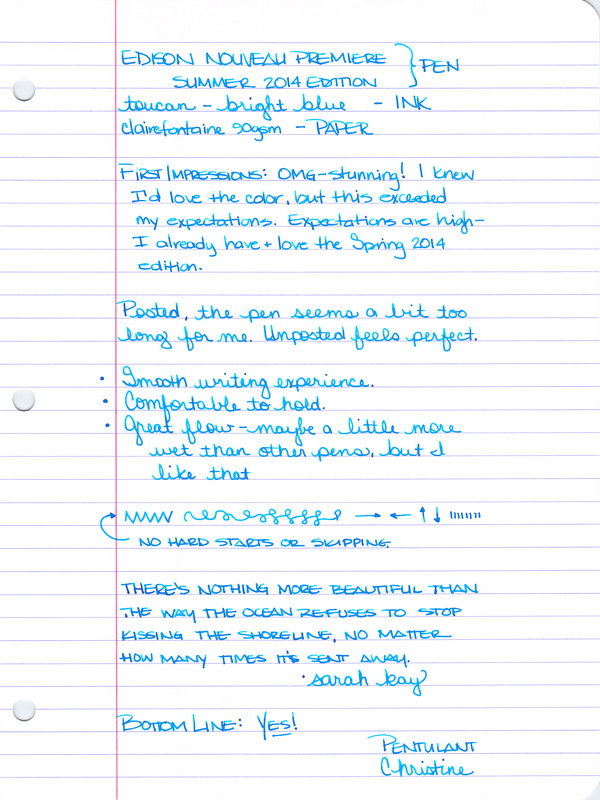 Click here to see the full-sized handwritten review. 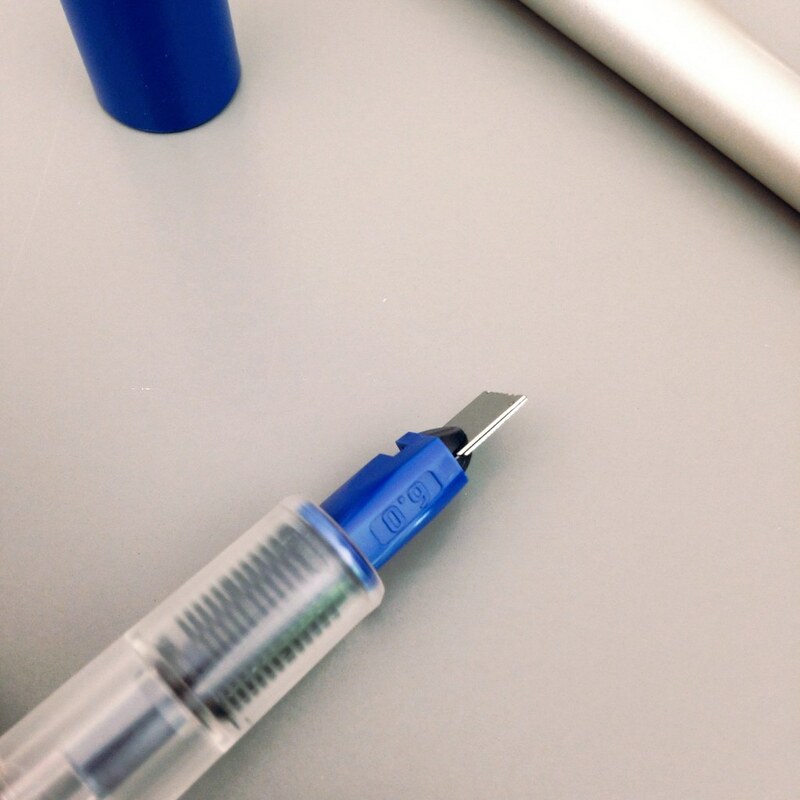 Someone on Instagram asked me how the nib compared with the nib of a Lamy Safari. 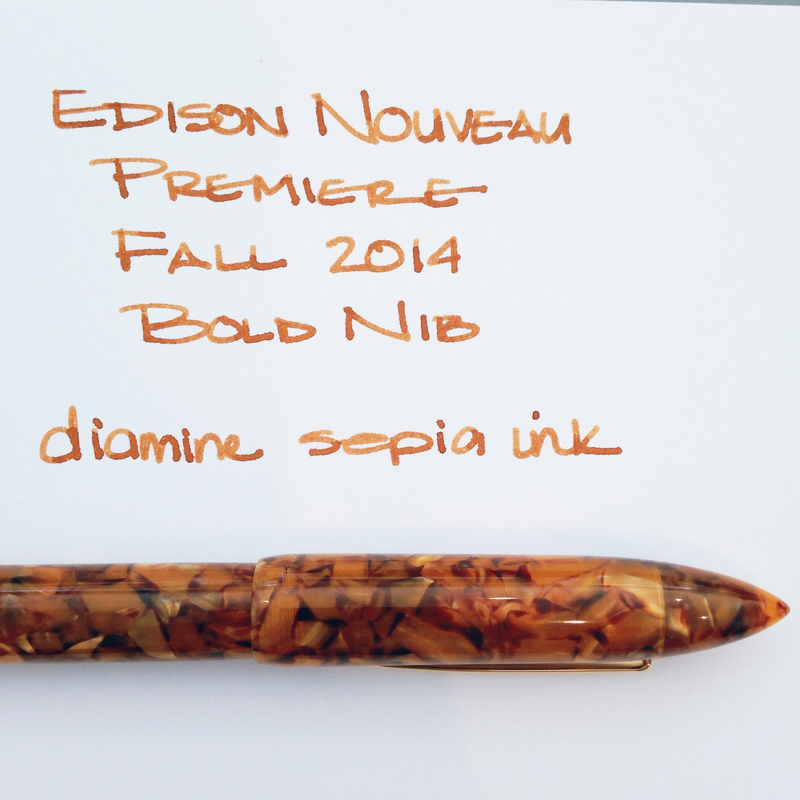 My answer is that the Edison Nouveau is more buttery smooth than the Lamy Safari. Some people like a little feedback when writing and others like a super duper smooth experience. I’d say that the flow is a bit wet – but I like that. 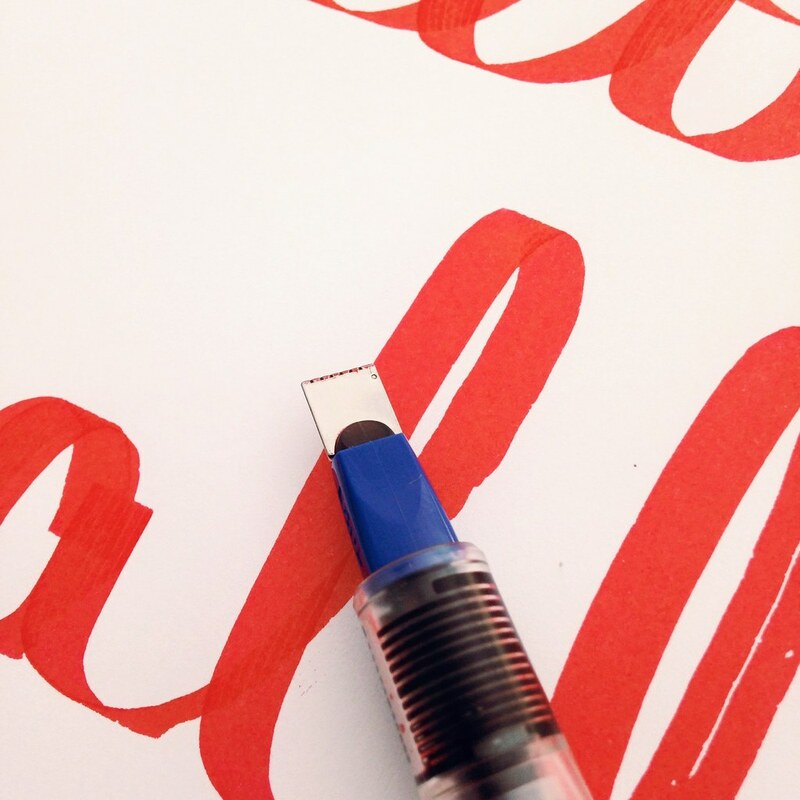 This nib is a medium, by the way. I just checked and the Carribean Sea is sold out. I’m pretty sure it will be back in stock, though – summer has just begun! OK, that’s that. What do you think? Did you order this one as soon as it came out? Will you be waiting for it to come back into stock? 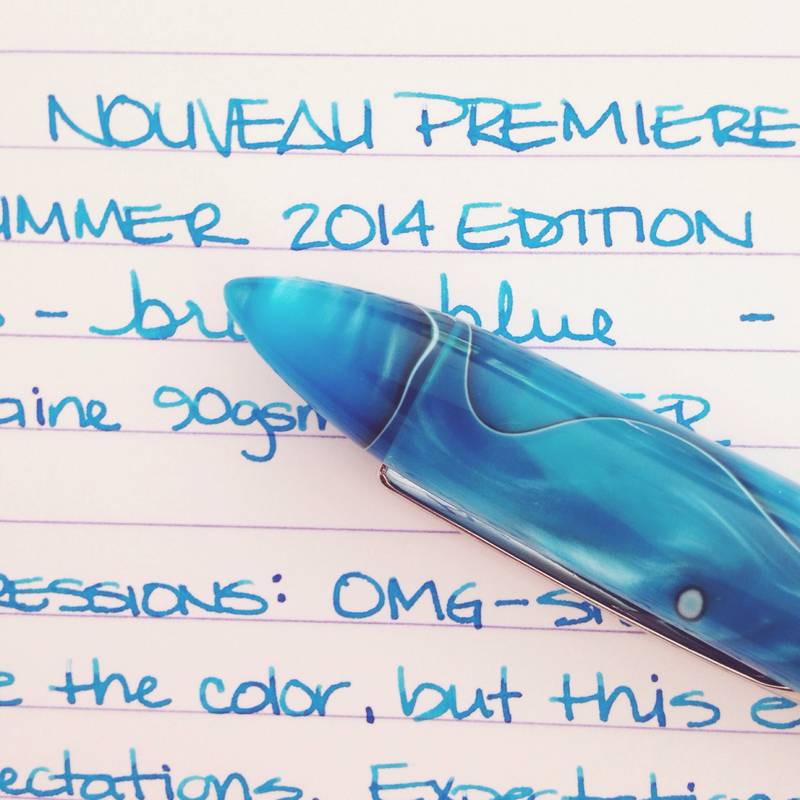 And…do you match your ink to your pen colors? I’ll be back later this week with an ink review! Edited to Add: It’s in stock – get it here! It has been busy around here the last couple of weeks! Mr. Pentulant graduated from his masters program, went on a short vacation, celebrated my birthday while we were away, and Mr. Pentulant started his fancy new job. Busy! Above is one of my birthday gifts from the mister. The pen is actually sitting on top of the box in that picture. 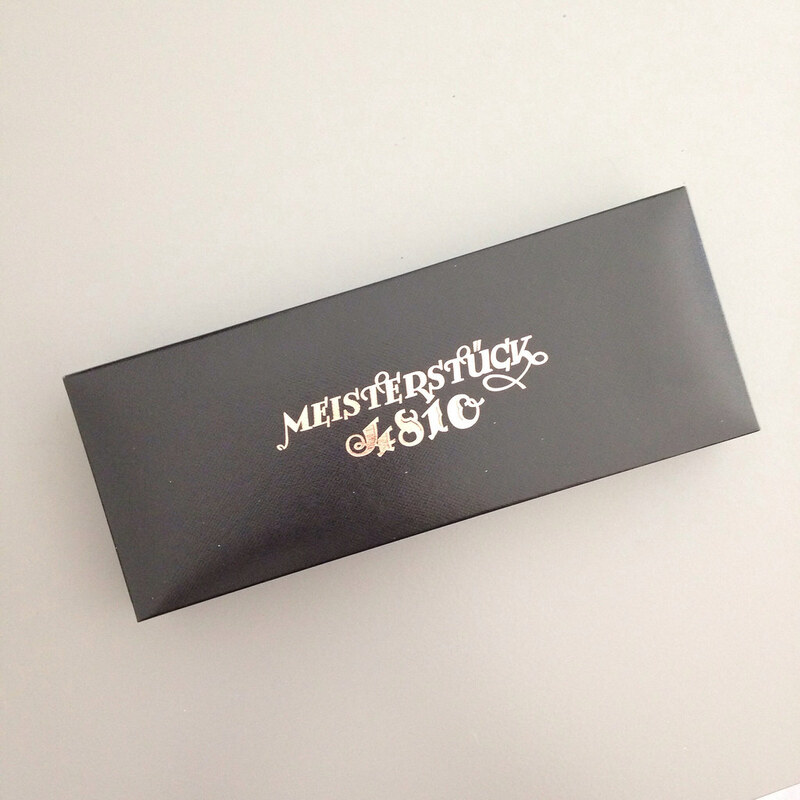 Here is the box without the pen . . . 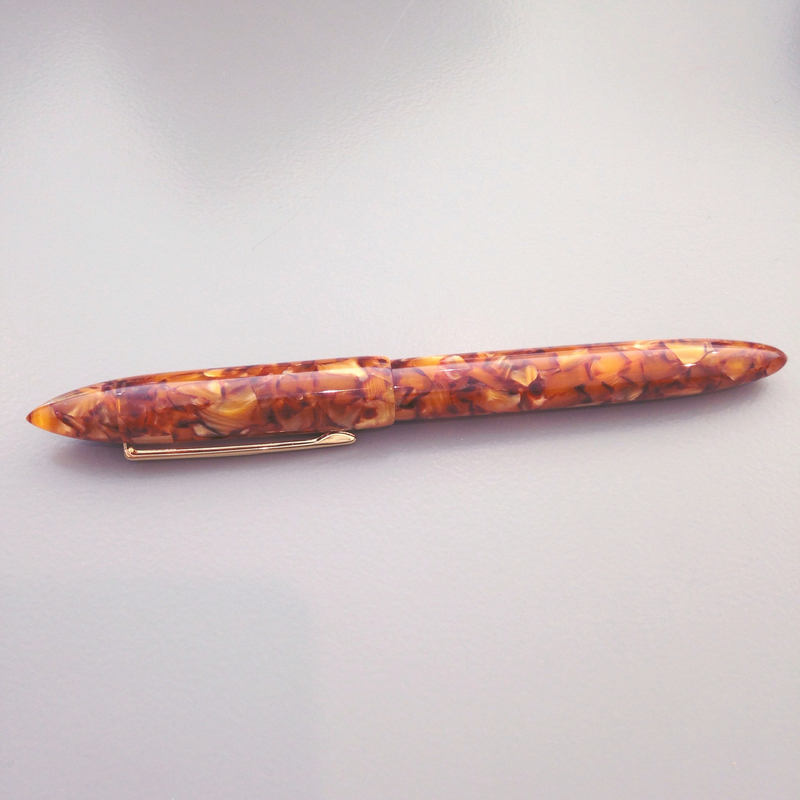 I find it interesting that it’s the 1912 Heritage (or perhaps the original safety pen?) on the sleeve. 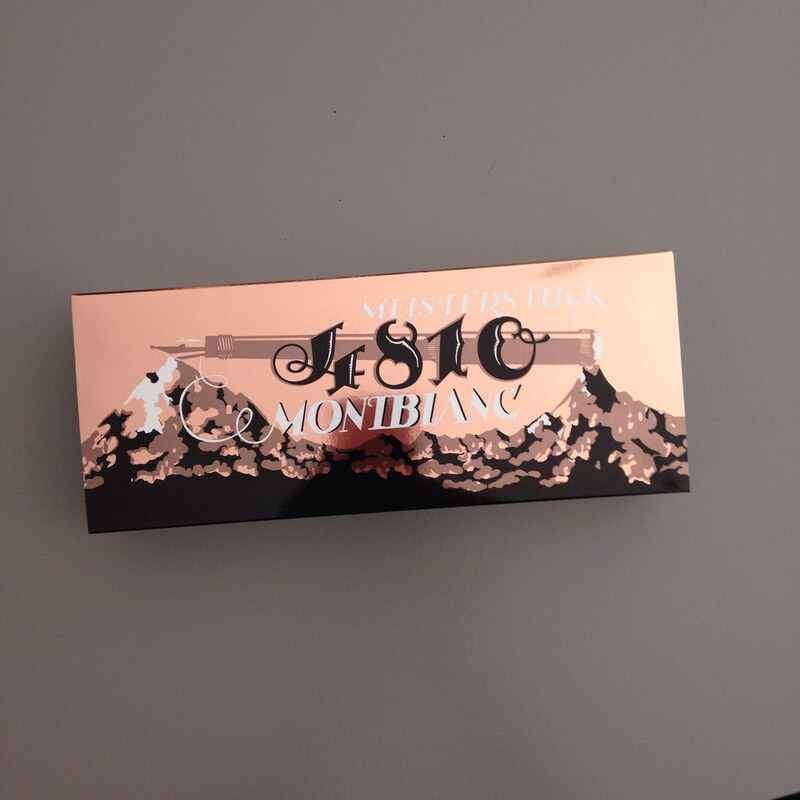 Also, my understanding from the Montblanc Facebook Page is that the shiny rose gold sleeve is only available for a year. 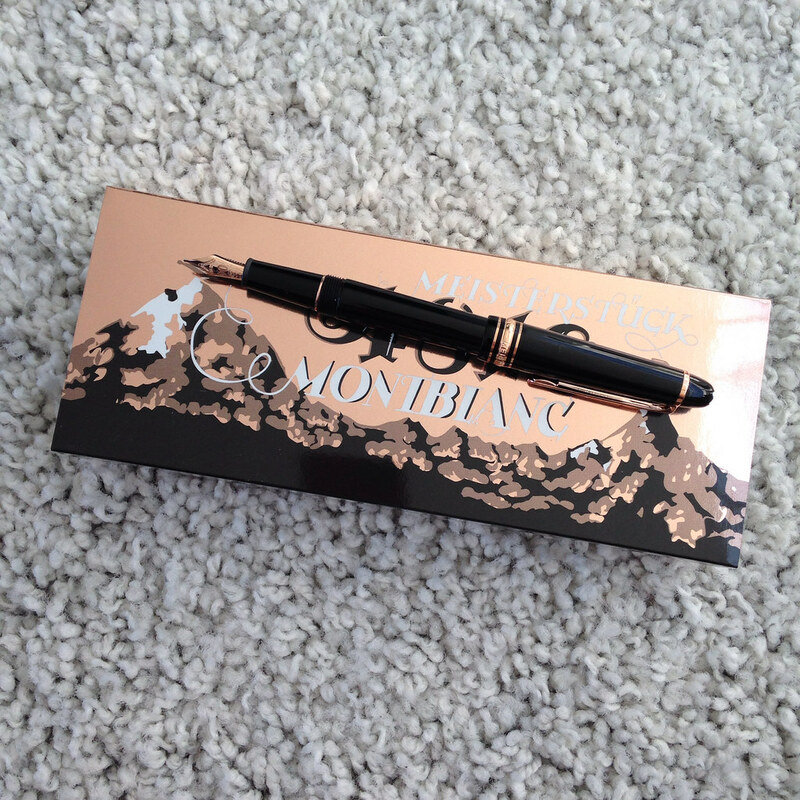 While I generally am not a huge fan of rose gold, there are so many things to love about this pen – the rose gold is deep and warm, the detailed design of the nib engraving, and (of course) the superb quality and reputation of Montblanc – it was definitely on my wish list. 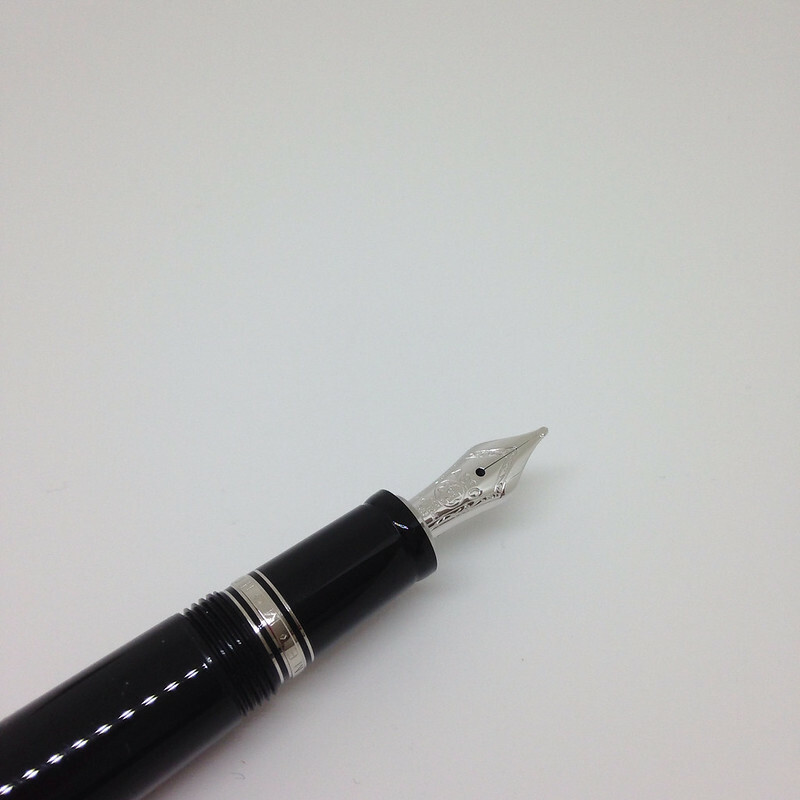 Mine has a fine nib. Even the sticker is rose gold . . .
And Mr. Pentulant correctly guessed that I would want a 145 – smaller-sized than the iconic 149 and with a converter rather than piston. I couldn’t wait to ink it up. 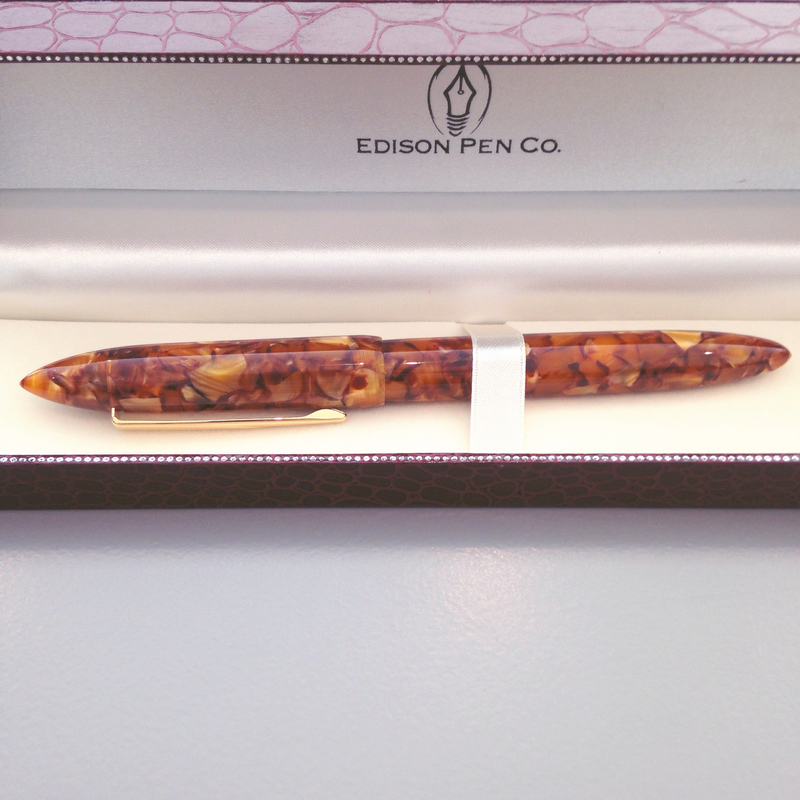 It’s a great pen – the style, the writing. 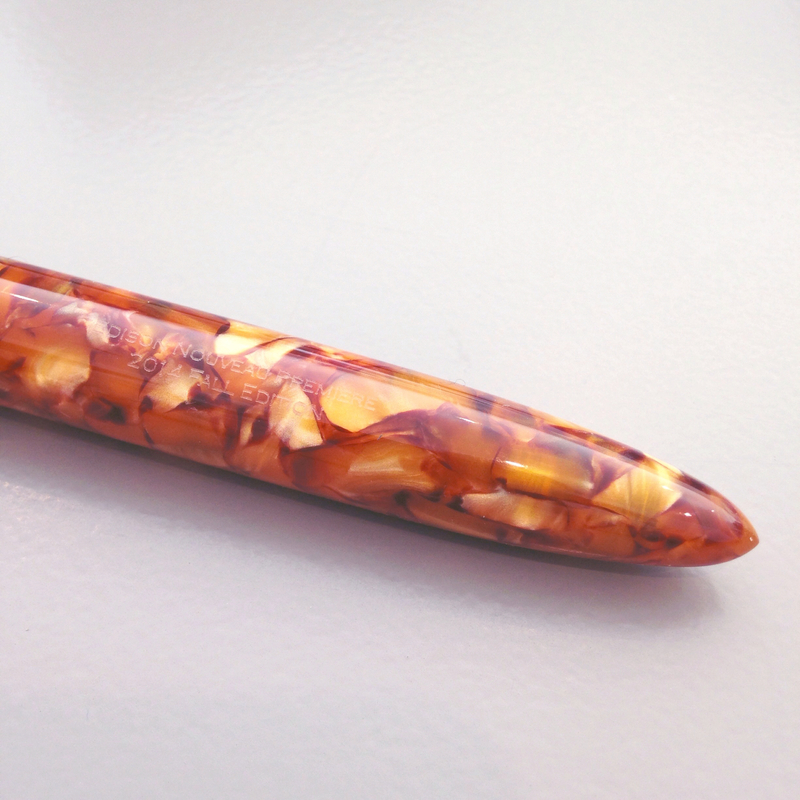 It sounds cliche, but the this pen really is an instant classic. A super-quick (ha!) 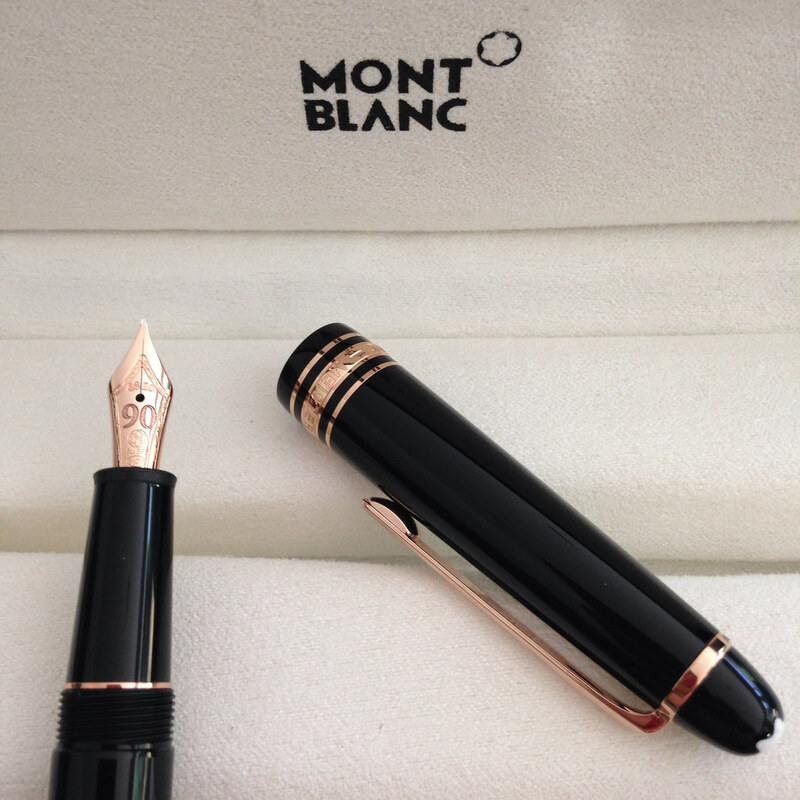 version of This or That – two Montblanc Fountain Pens – the fancy newish Heritage 1912 versus the classic and much-loved retractable nib Boheme. 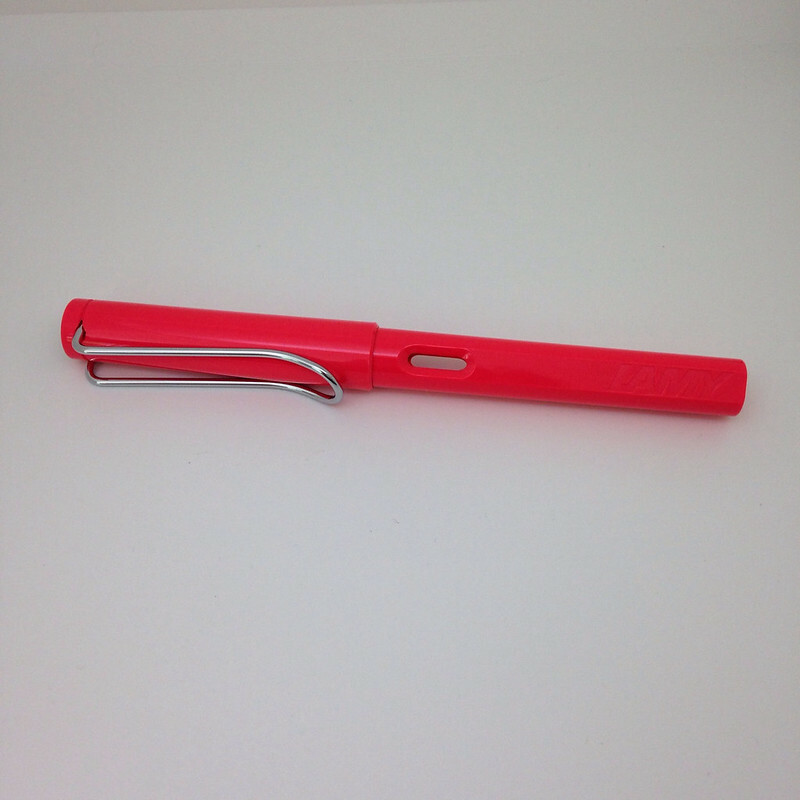 But first – did you see that I’m giving away the new Lamy Safari in Neon Coral? Enter here. On to This or That . . . These are each great pens that write really well. 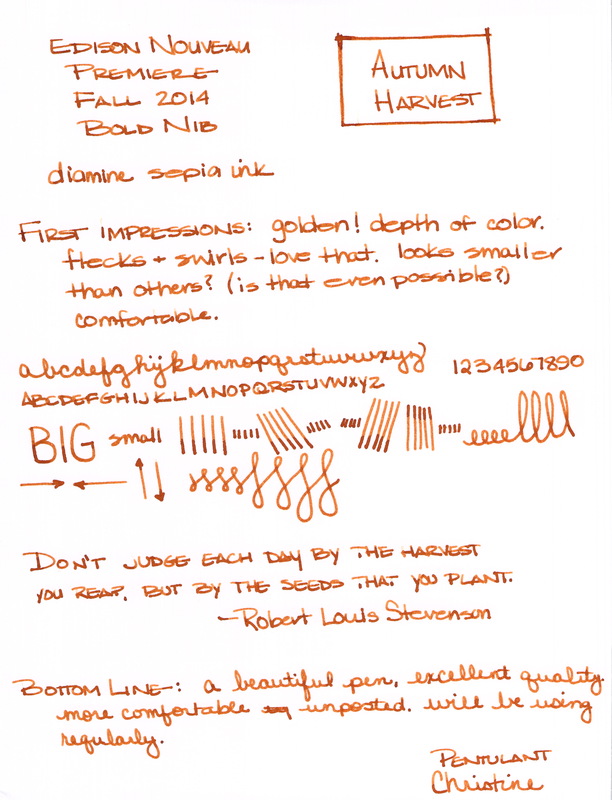 I had the Heritage inked with Pilot Iroshizuku Fuyu-syogun from this review and inked the Boheme with Montblanc Oyster Grey in anticipation of writing this post. 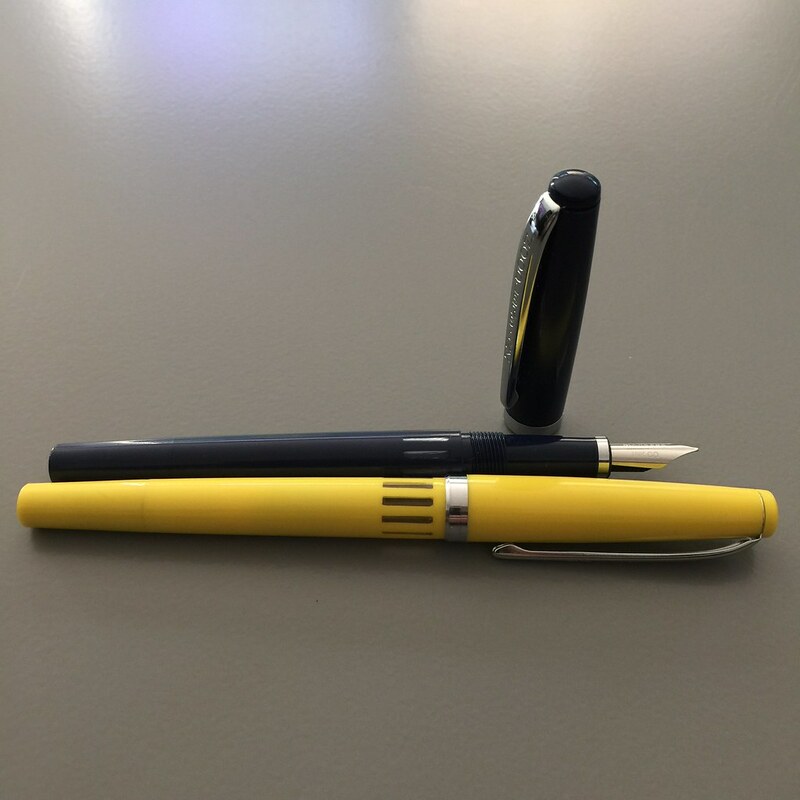 I’m not showing any writing samples today – suffice it say that the writing experience is pretty terrific with both pens. 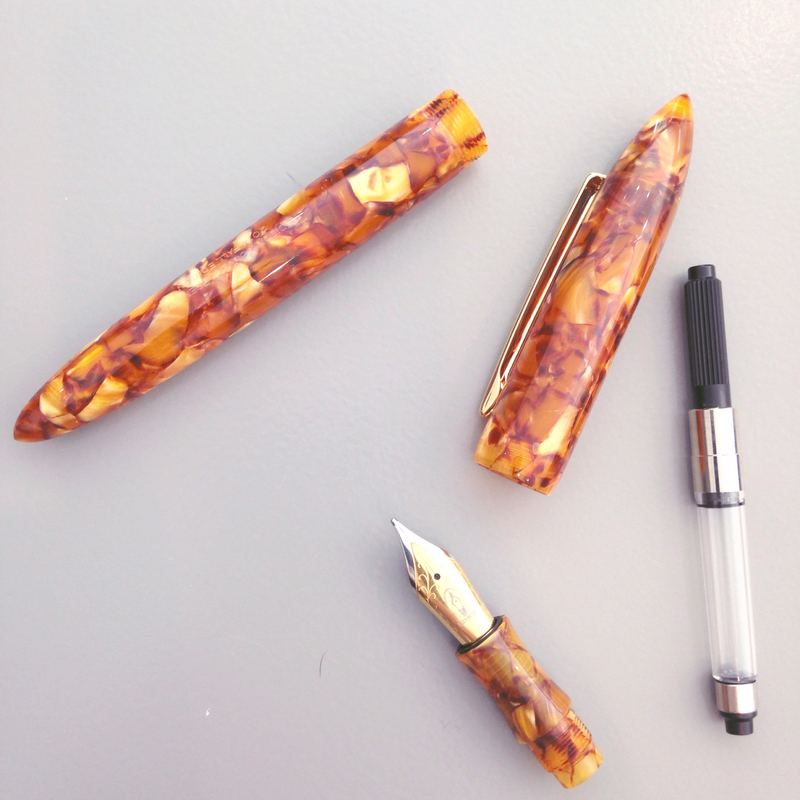 Other than the great brand, precious resin, and amazing writing, the greatest similarity between the two pens is the retractable nib. The biggest differences are . . . Fill System The Boheme will only accept cartridges (standard short). The Heritage has a unique piston filling system. 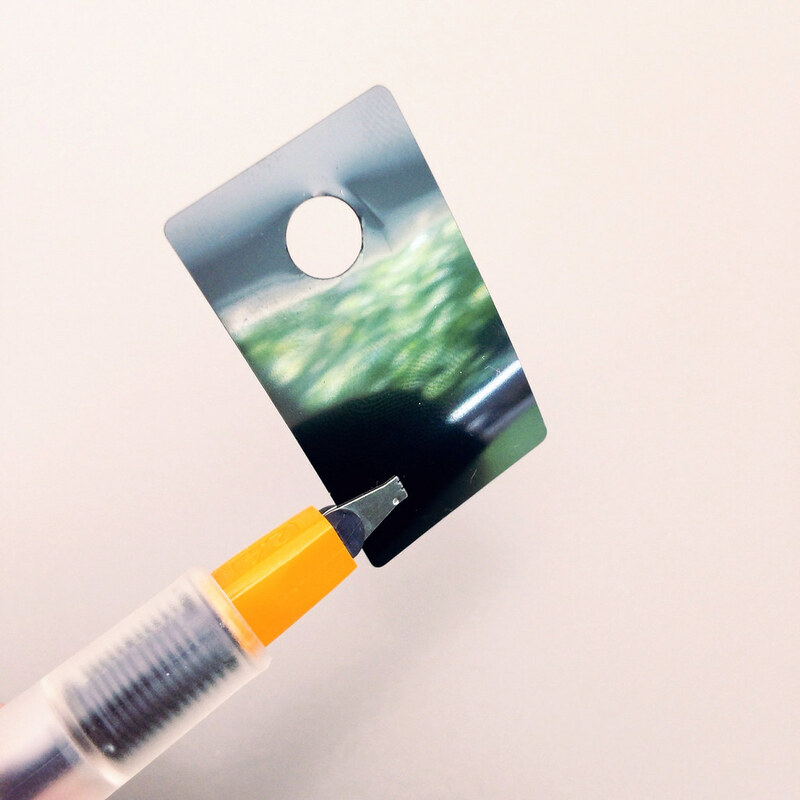 Cartridges are convenient, for sure – just pop one in and go (well, after waiting a few minutes or more for the ink to work its way through the pen’s capillary system). There are approximately a zillion more colors of bottled ink available than cartridges. 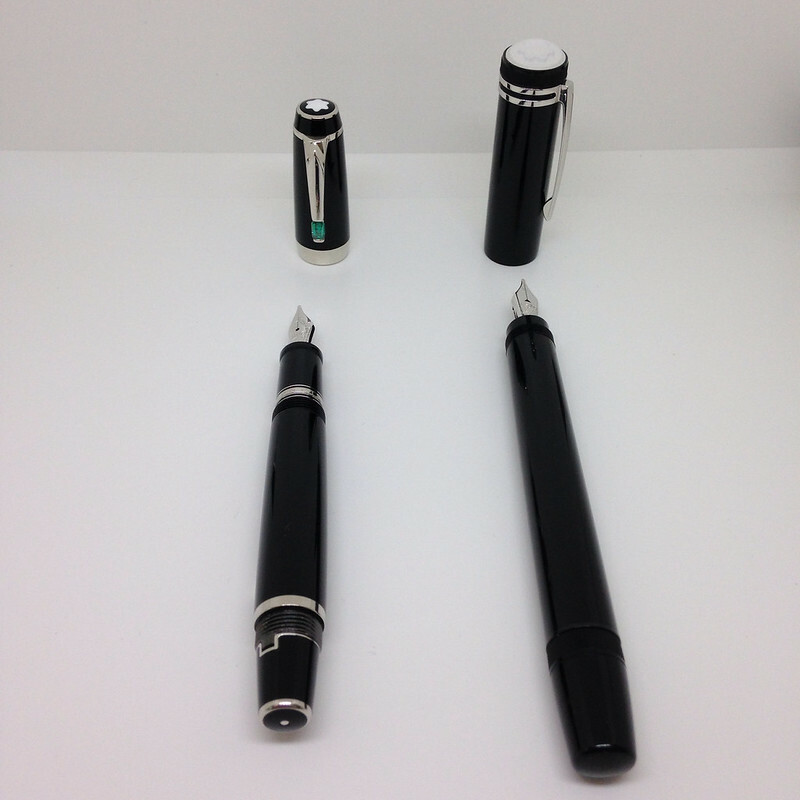 Also, fill with a piston and you’re ready to start writing immediately. 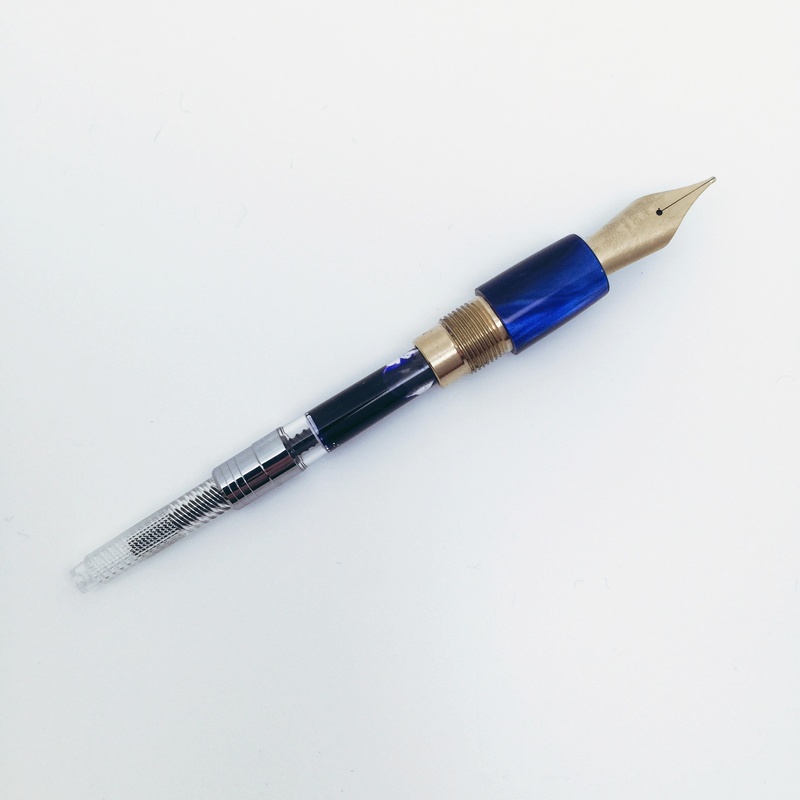 Posting the Cap The Boheme is designed to be posted – to advance the nib, simply screw the cap on to the end of the pen – it’s perfect, really. There is no way for the cap to work its way loose with normal use. The Heritage, on the other hand, is not meant to be posted – annnnnd despite the pictures on the MB website (this kills me, in case you’re wondering), it cannot be properly posted. This could be a deal-breaker for some people. 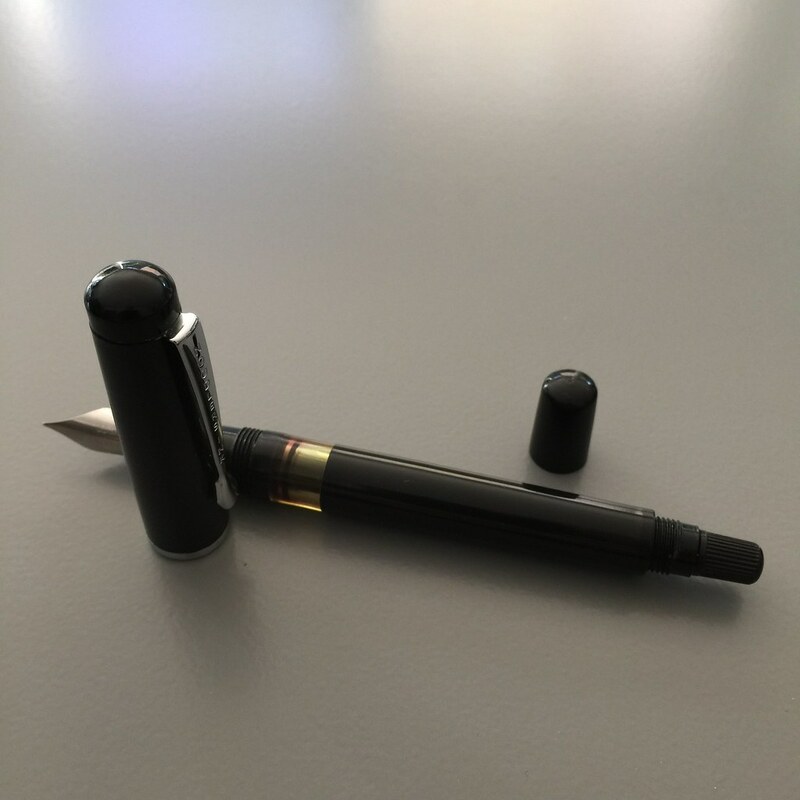 Size Capped, the Boheme is smaller – practically pocket-sized. Uncapped, the Boheme is still smaller. However, posted, the sizes are comparable. 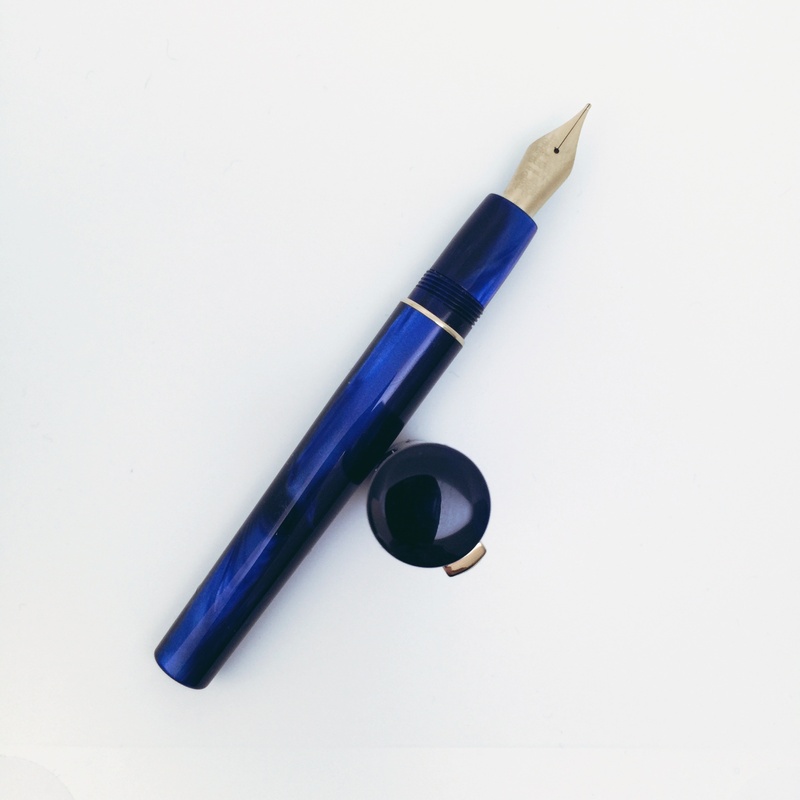 With each pen in the ready-to-write position, the Boheme is around 1/2 inch longer than the Heritage. Grip The Boheme (shown above) features a very slightly flared grip. I find it very comfortable to hold. The Heritage (below) is quite smooth. I also find it very comfortable. I can see that some people would have an issue with the Heritage. For example, if you have especially (ahem) moist hands, maybe your grip would be too slippery to be an enjoyable writing experience? While I’ve not yet cleaned the Heritage (not even before I inked it because I’m pentulant like that), I imagine it will work like any other piston fill pen. Let’s talk about money . . . Right now on the MB website, Bohemes range from $690 – $1645. The Heritage is $1,110. 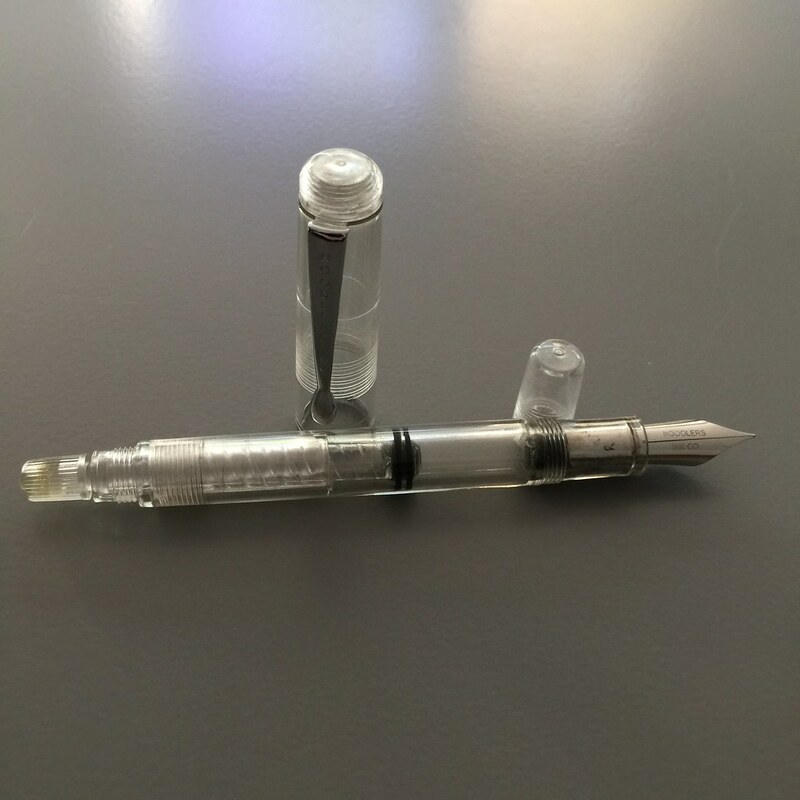 Of course, you can probably find a better deal for each on eBay – and the very good news is that the retractable nib pens are (to my knowledge) not counterfeited. 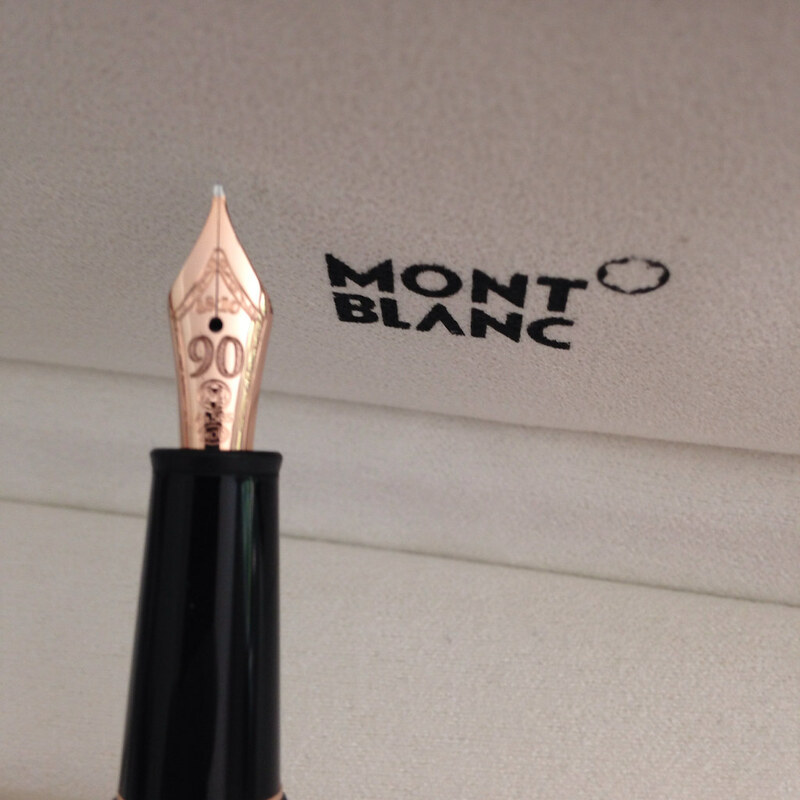 Right now, I’m a huge fan of the Montblanc Heritage 1912. 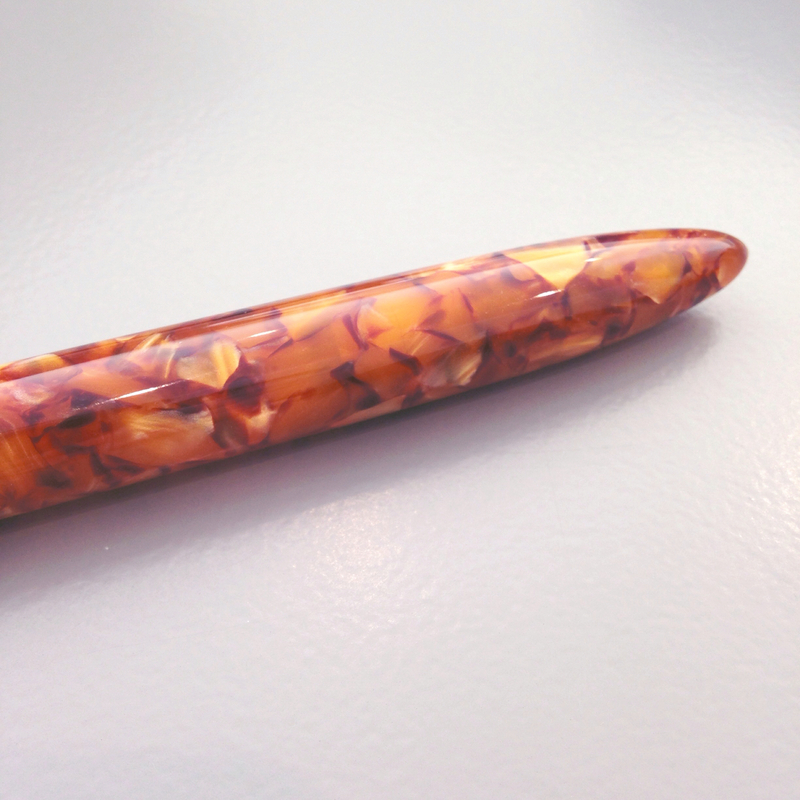 I’ve mentioned to more than one person that I think it’s my favorite pen – maybe even my grail pen. I love it that much. Having said that, I also love my Boheme collection. 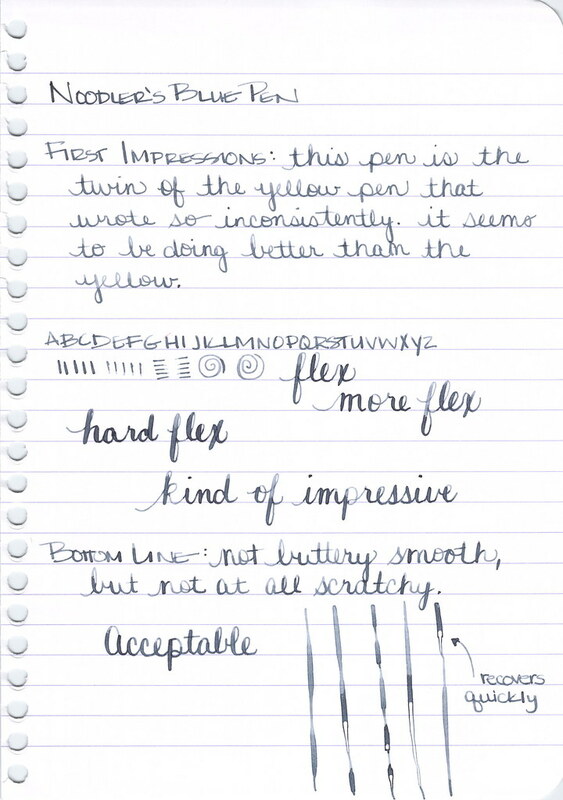 As each pen is a terrific writer, it’s really going to come down to personal preference. I’ve outlined the things that I think could make or break a decision. Now, you tell me – This or That? Which would you choose?